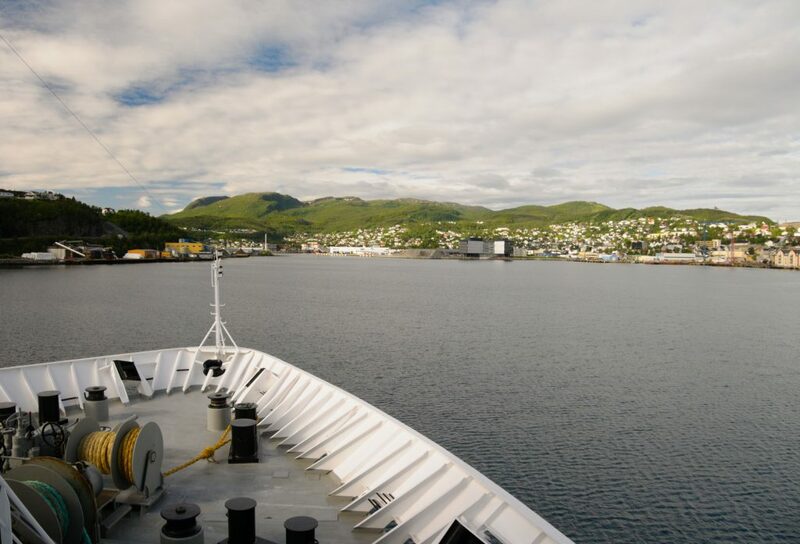 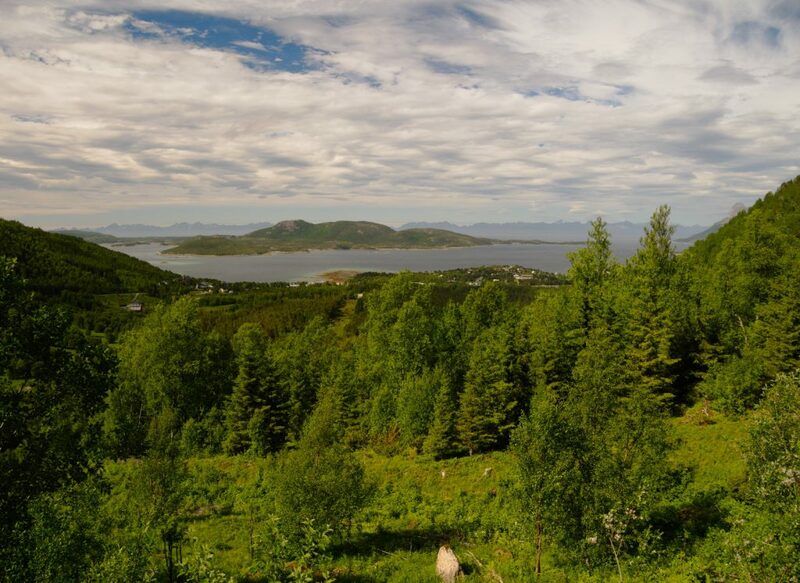 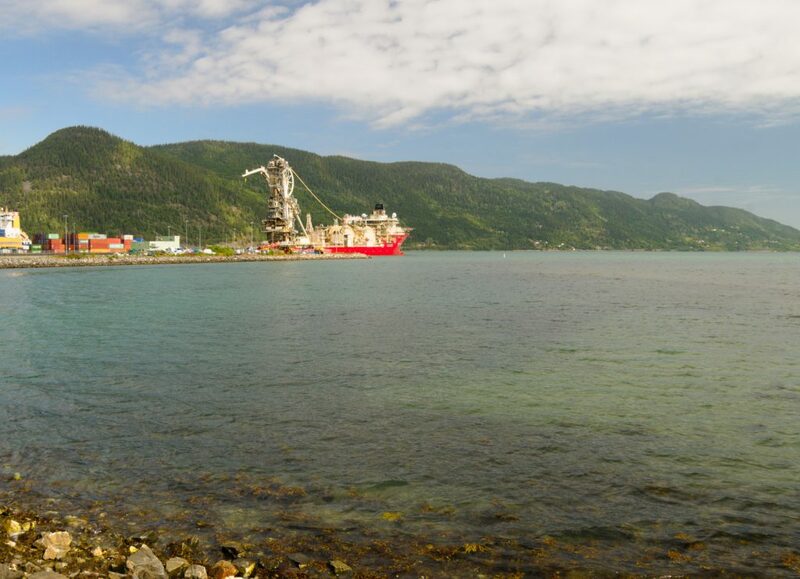 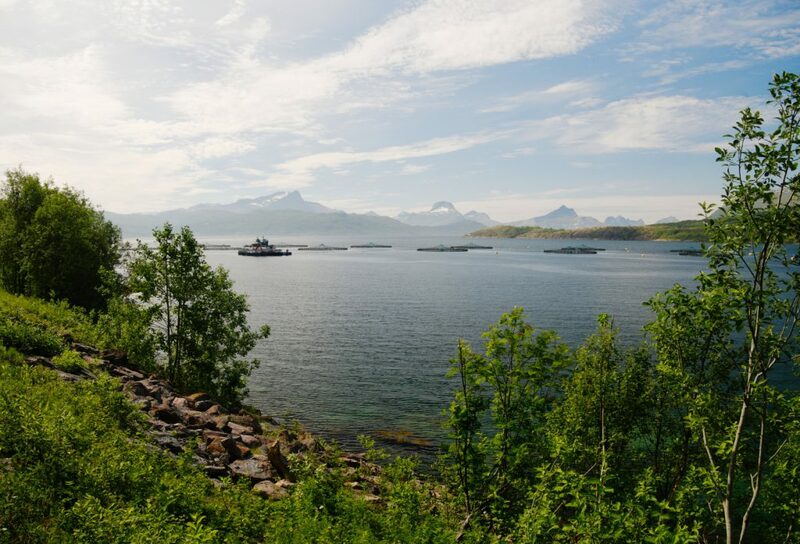 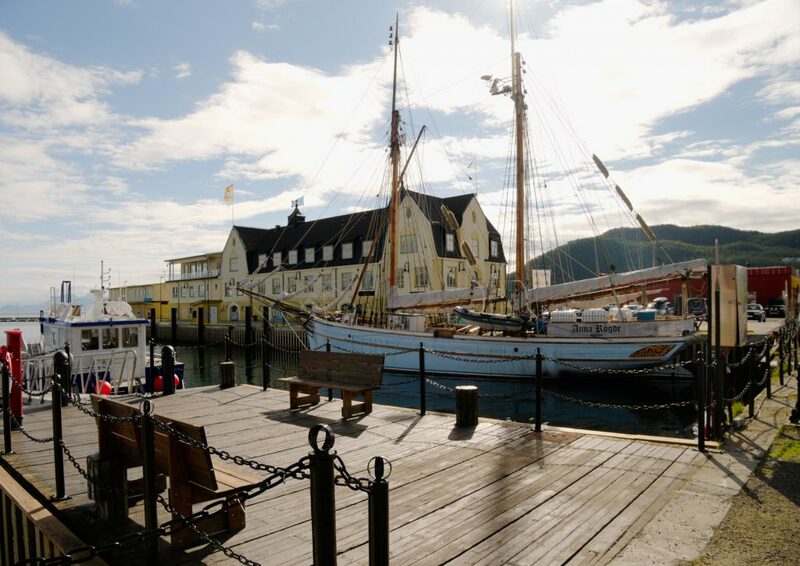 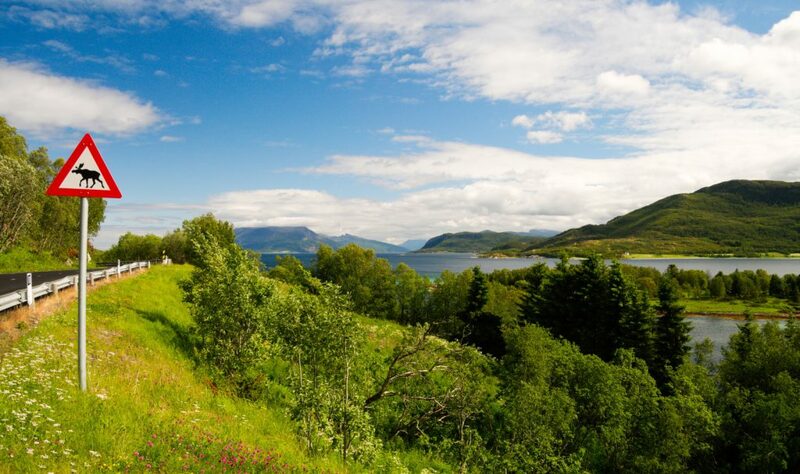 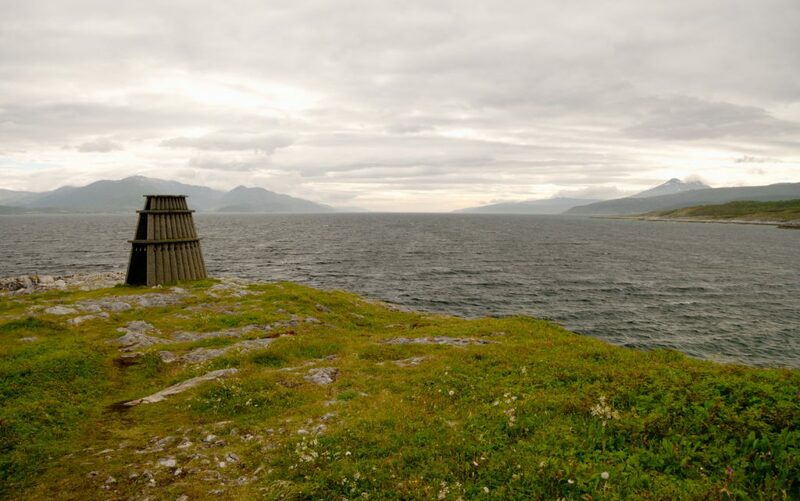 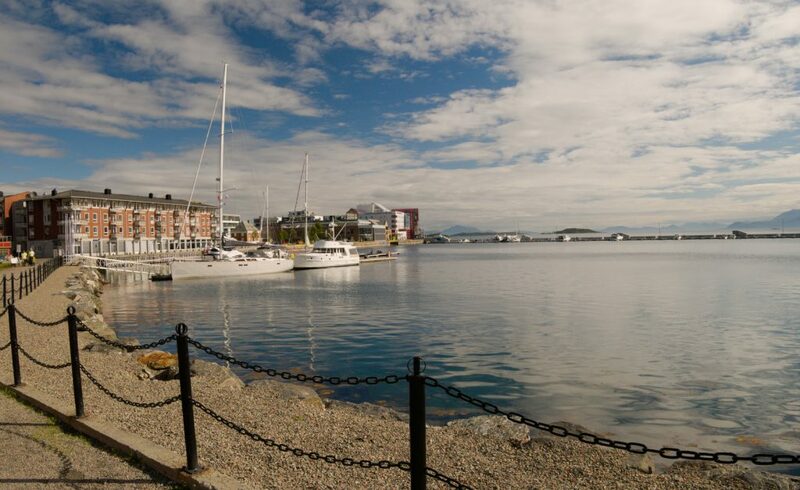 I disembarked the ship in Harstad and continued south over the district of Ofoten. 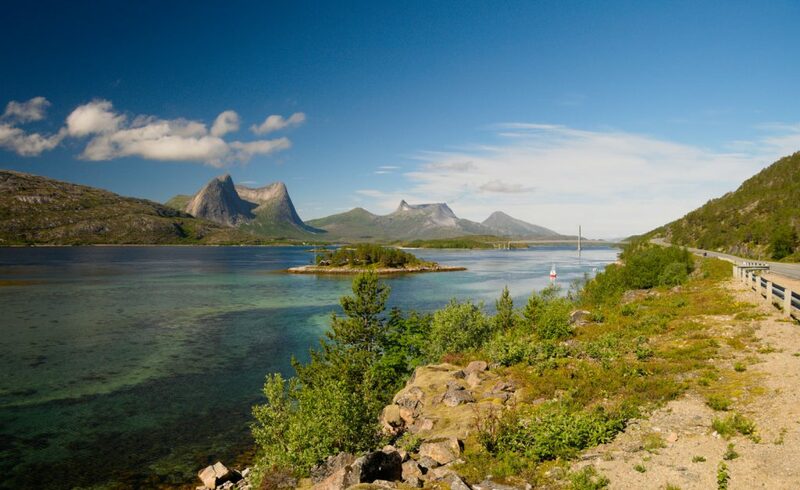 Some time ago I was nearby at Lofoten. 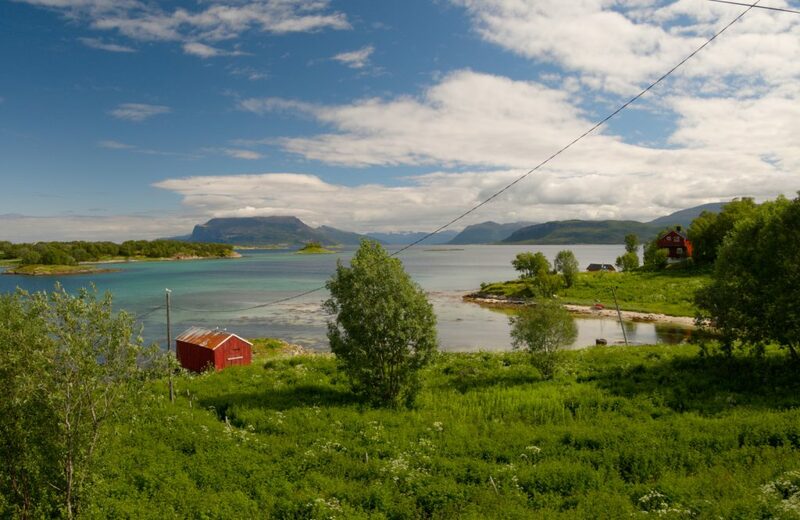 And while then I had the impression that here beyond the Arctic Circle is already the wild north, now when arriving from Lapland and Nordkapp I had the opposite feeling of coming back to comfortable civilization – lots of villages, shops everywhere, reindeers replaced by sheep, horses and tractors, grass grows on meadows. 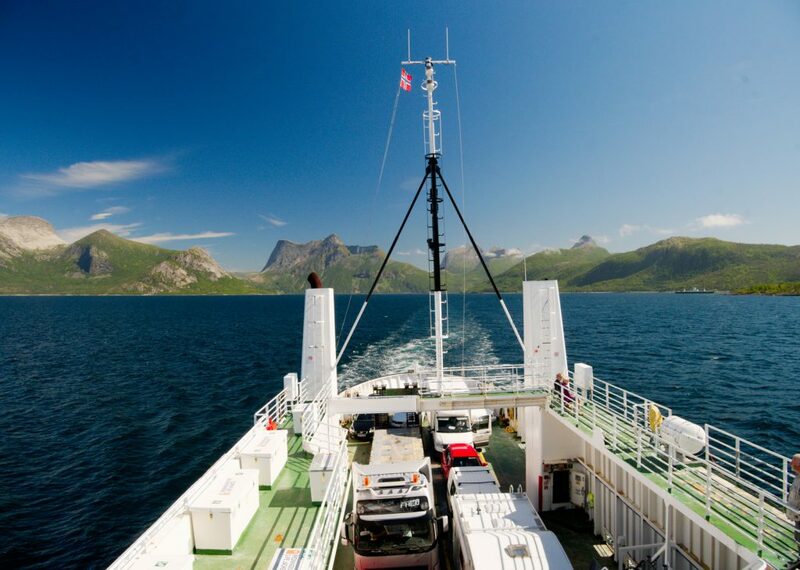 The same day I sailed again (a small rural ferry), and the no-cash strategy from Belarus worked again: while the ferry is not free here, only at the pier I realised I only got cash in Euro (as otherwise they accept cards everywhere throughout Norway) – when I offered those, the ferry captain decided he will better take me for free. 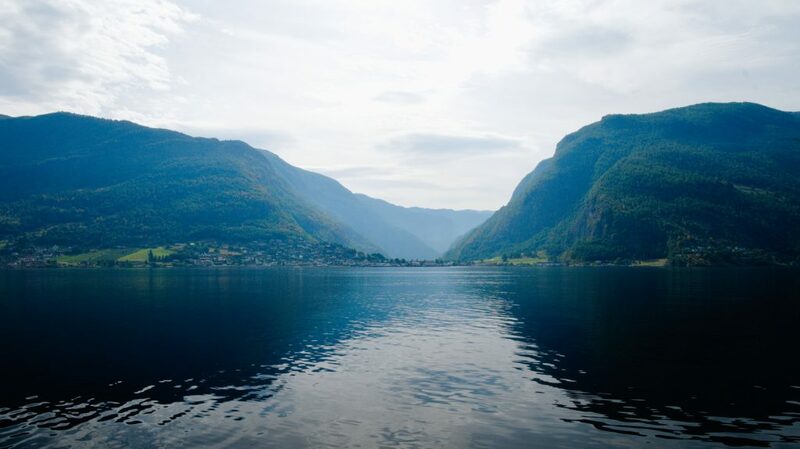 On top of that, on the ferry was a local guy who sat next to me and offered me to sleep in his garden in a beautiful place by a lake. 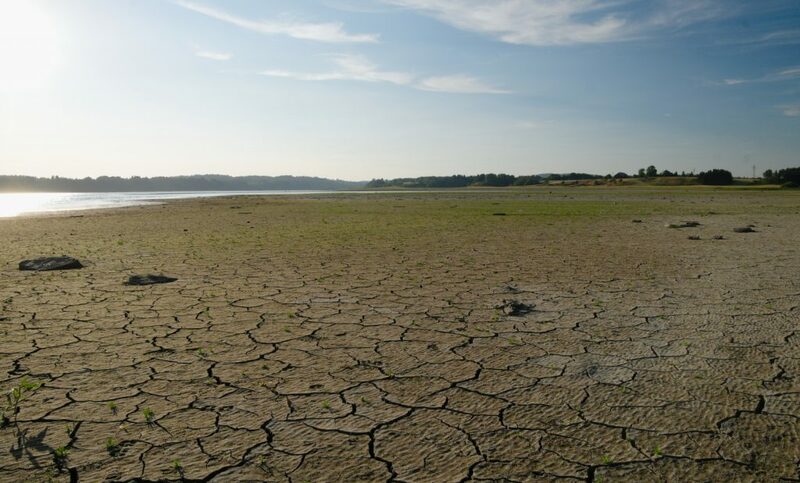 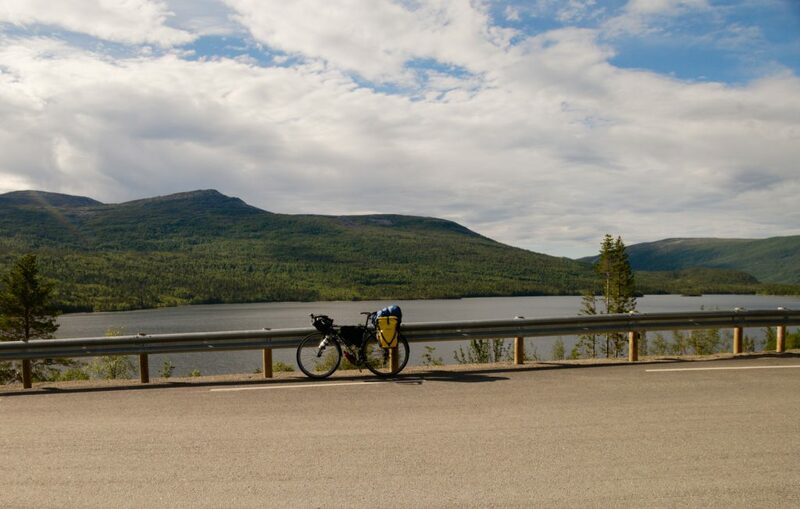 He explained that only a few days ago he hosted in his garden a man cycling around the world. 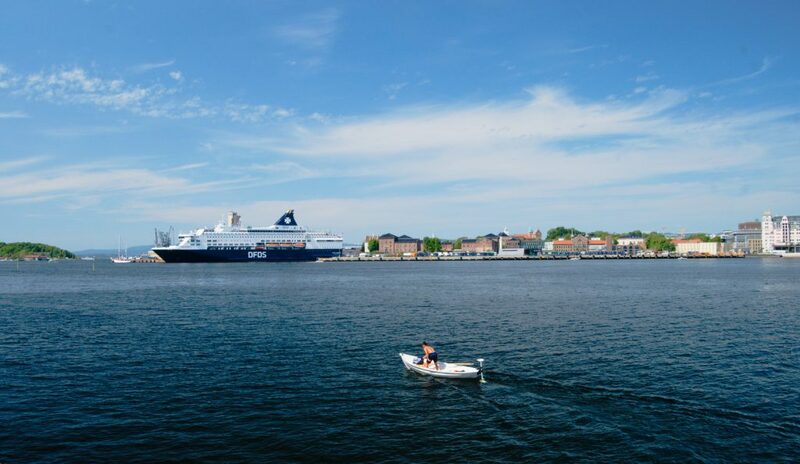 The next day I took much larger ferry on the main road and while I was officially charged and received a receipt, for which they specifically called to me a guy with the receipt-printing terminal, the ticket price for a cyclist was zero and I sailed again for free (I did not understand why the ticket was so important then…). 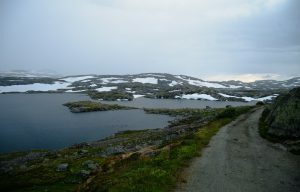 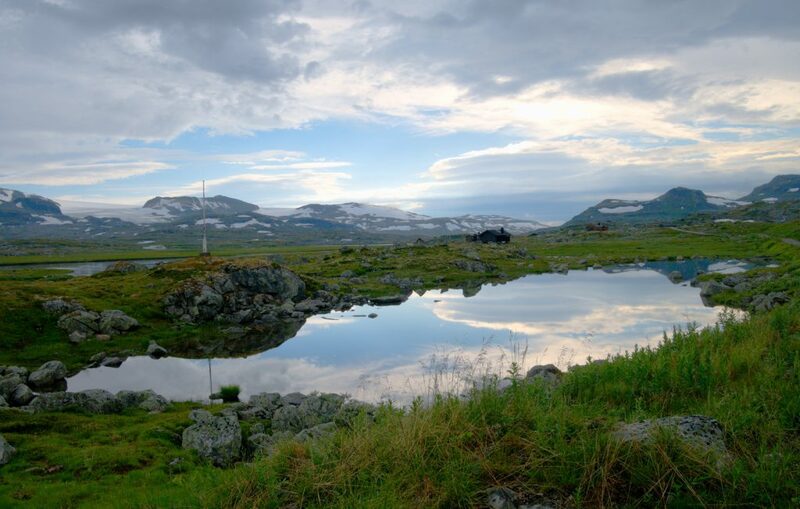 Local landscape is composed of deep jagged fjords (the open sea is somewhere 50 km or more in the west, so there is no difference here between what is officially an island and what is already the mainland) an lakes. 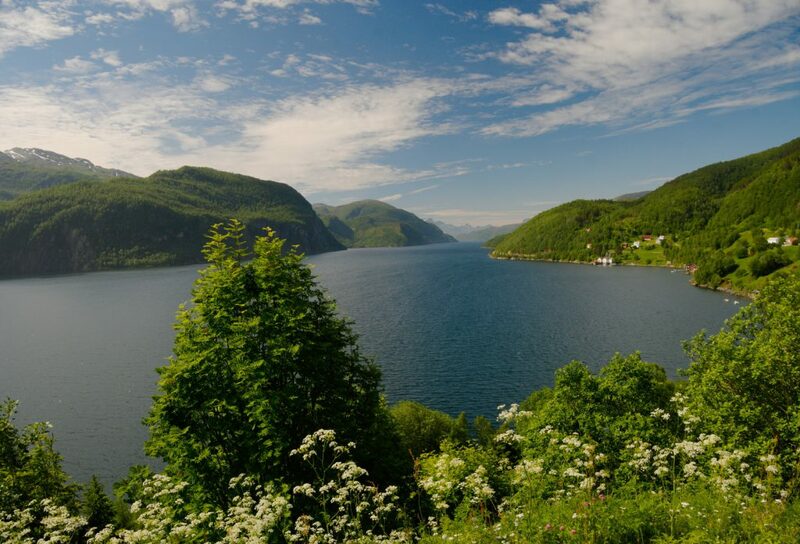 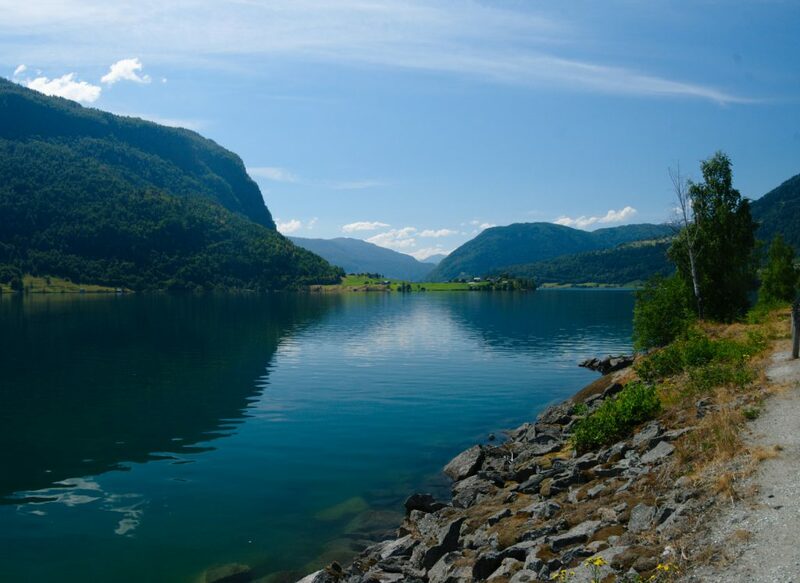 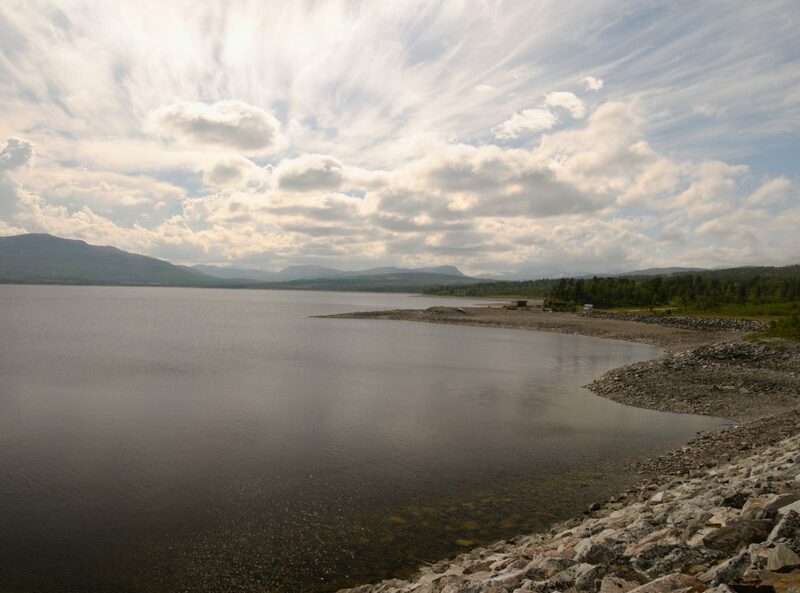 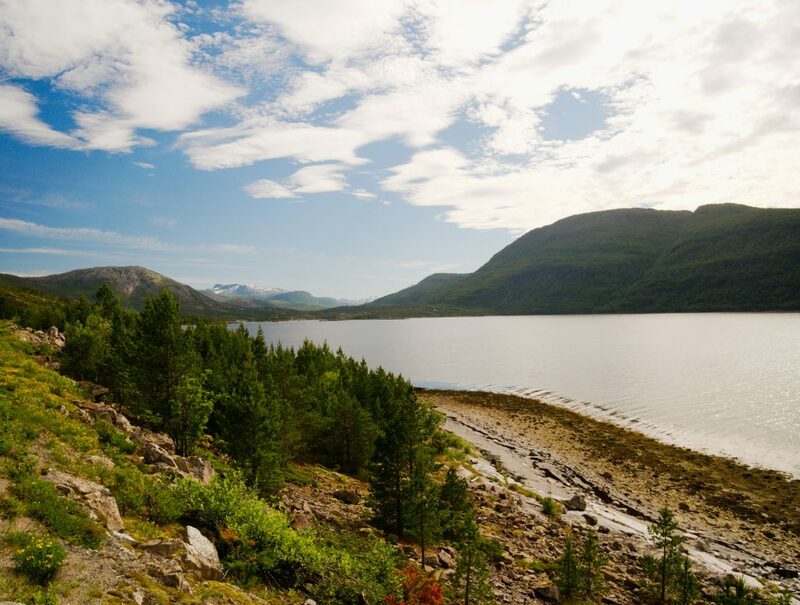 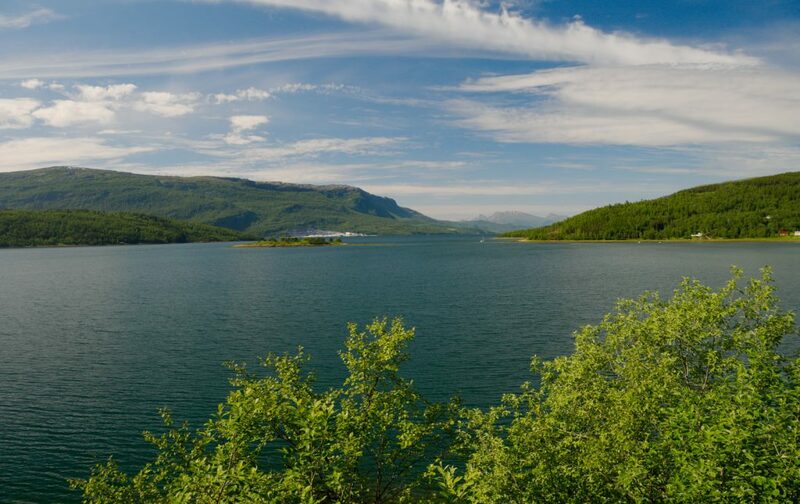 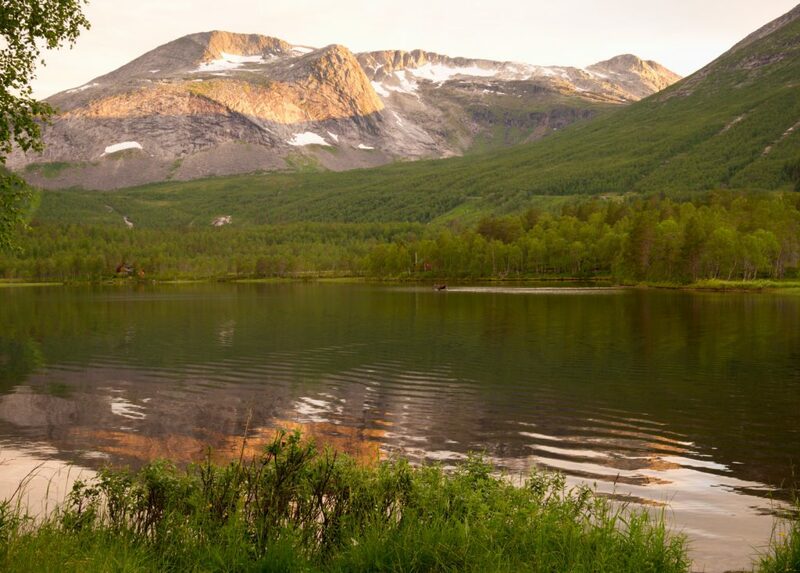 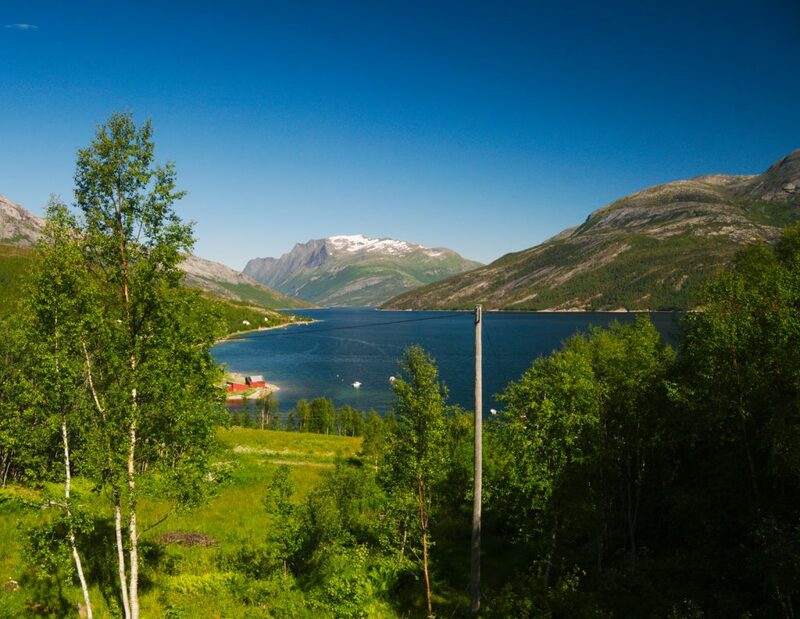 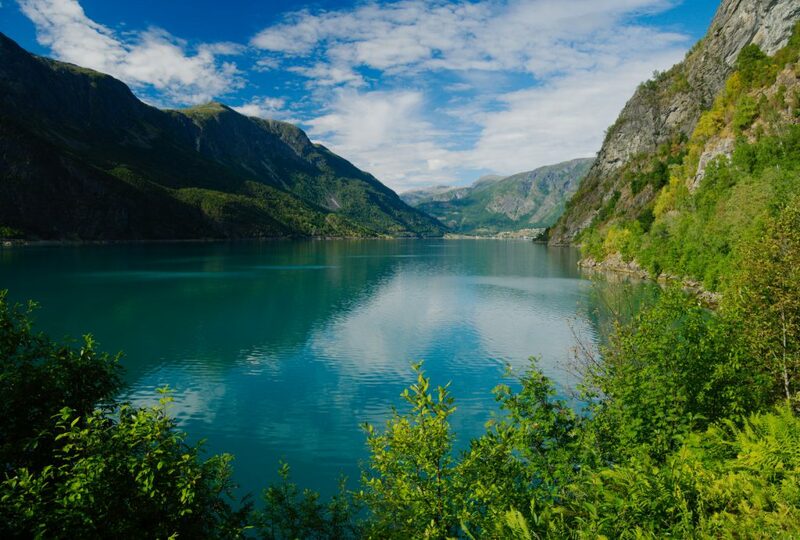 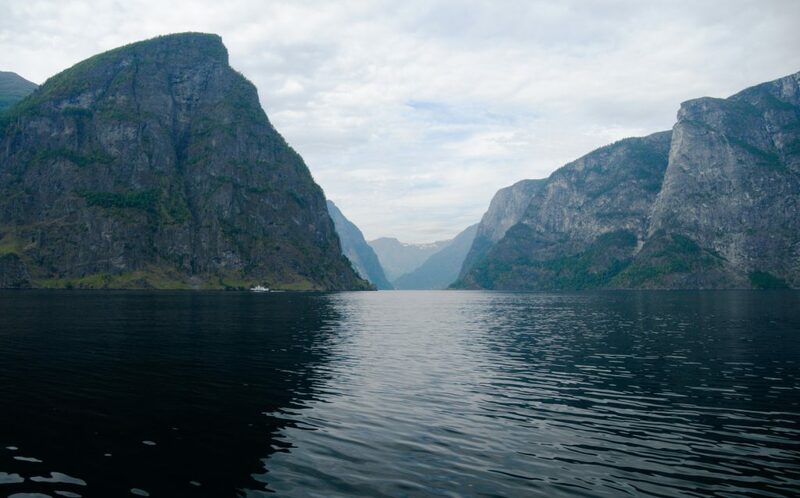 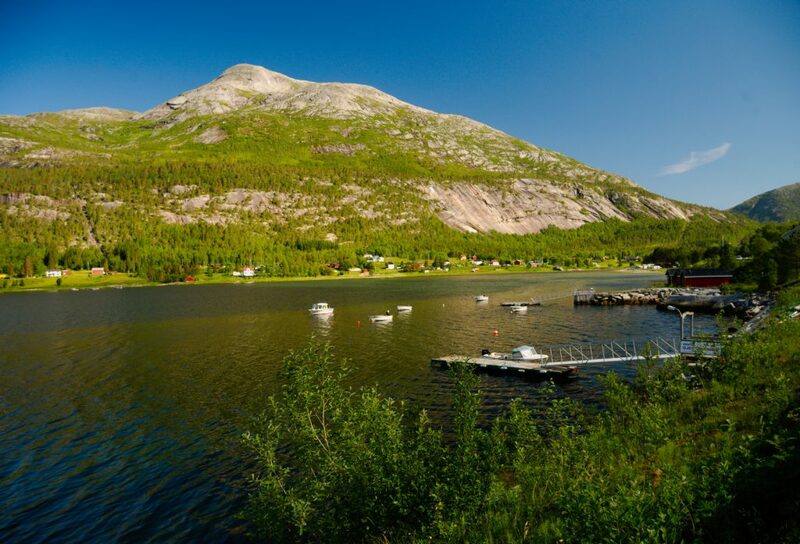 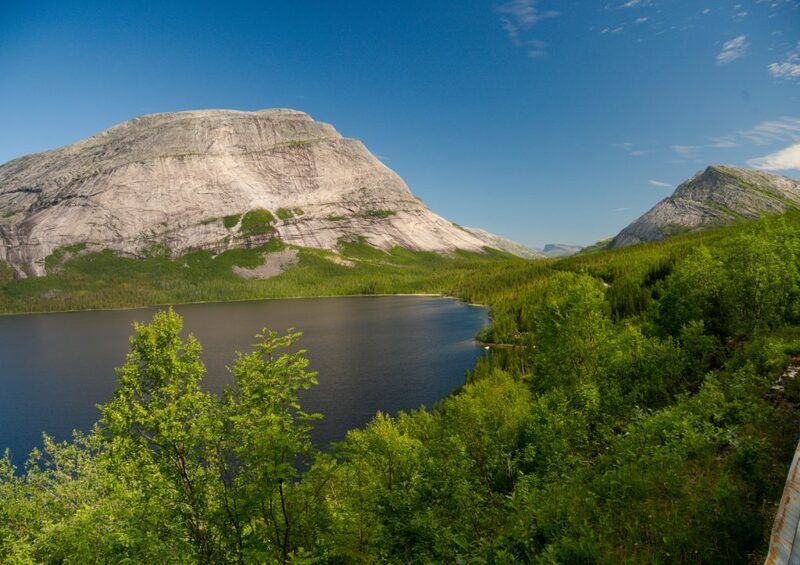 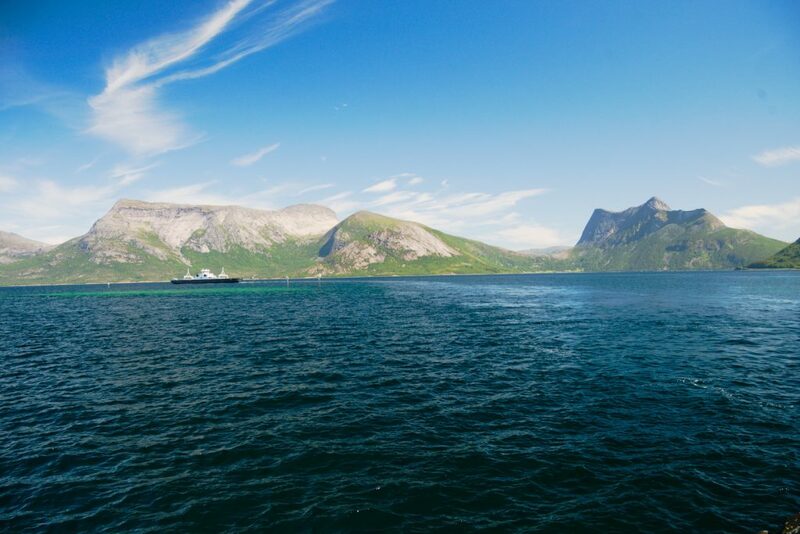 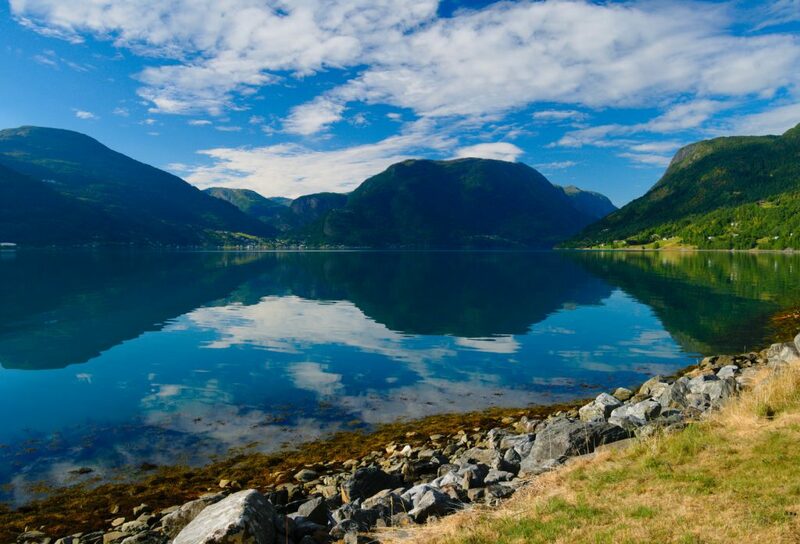 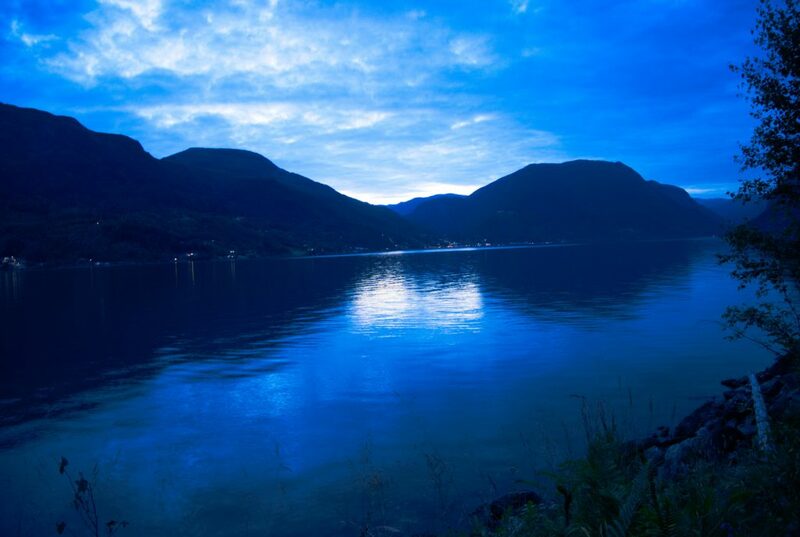 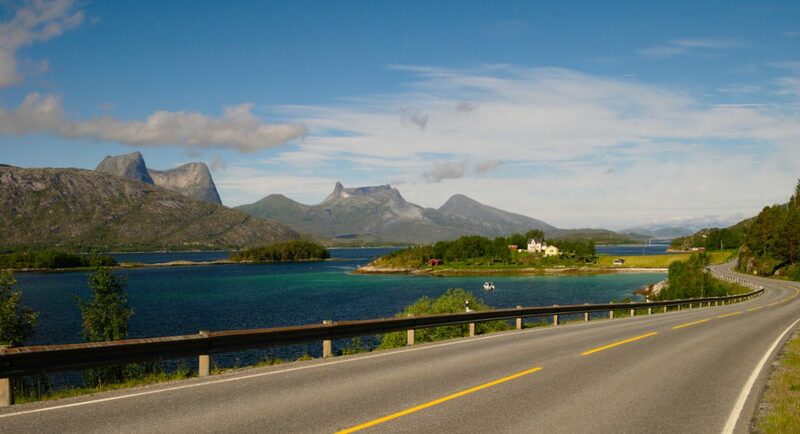 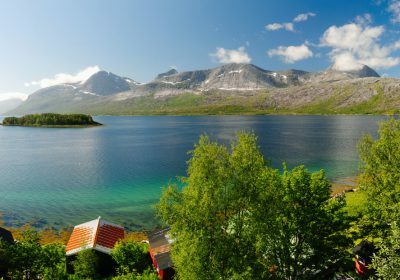 The fjords and lakes are surrounded by over 1000 metres tall shark teeth shaped mountains. 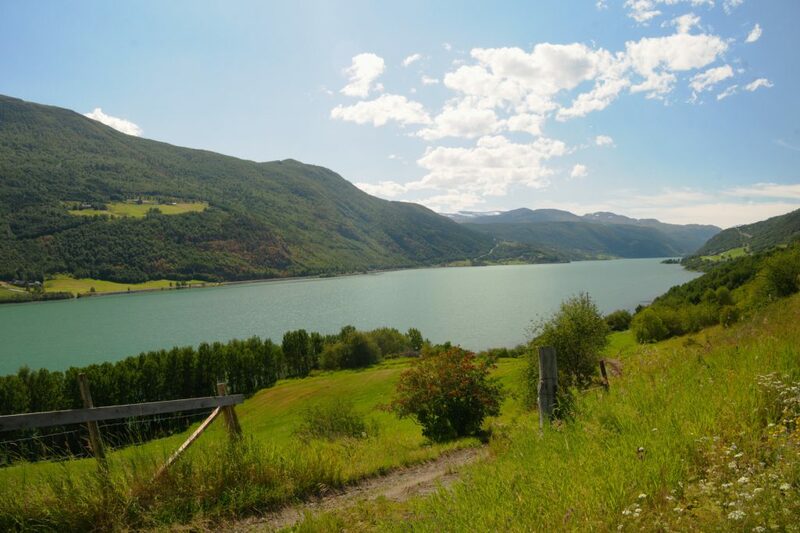 It is also a paradise for fishermen here, you can both see the fish by naked eye in the clear water in the lakes and rivers and hear them as they catch the flies. 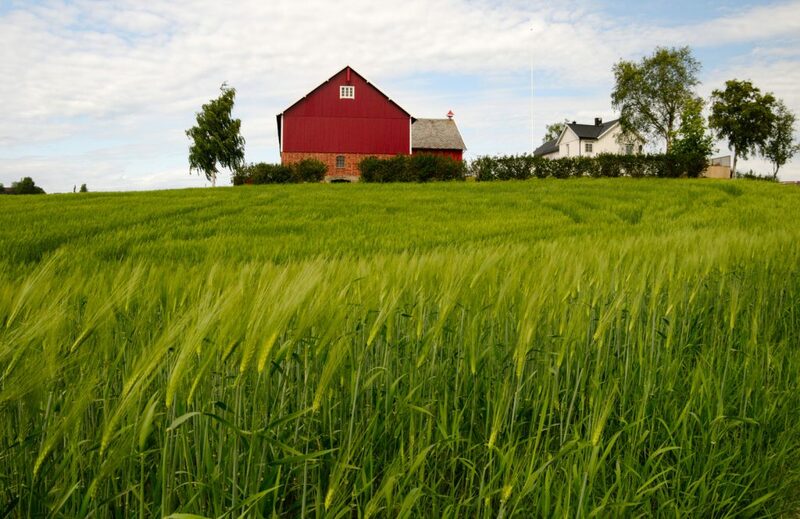 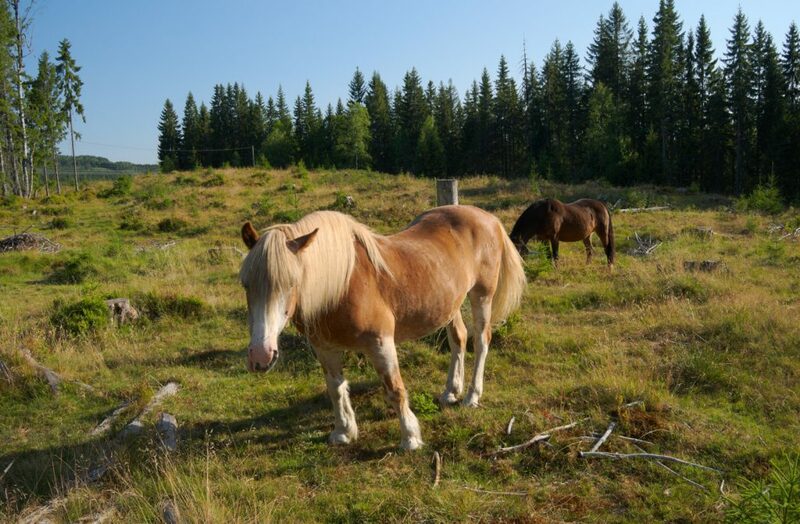 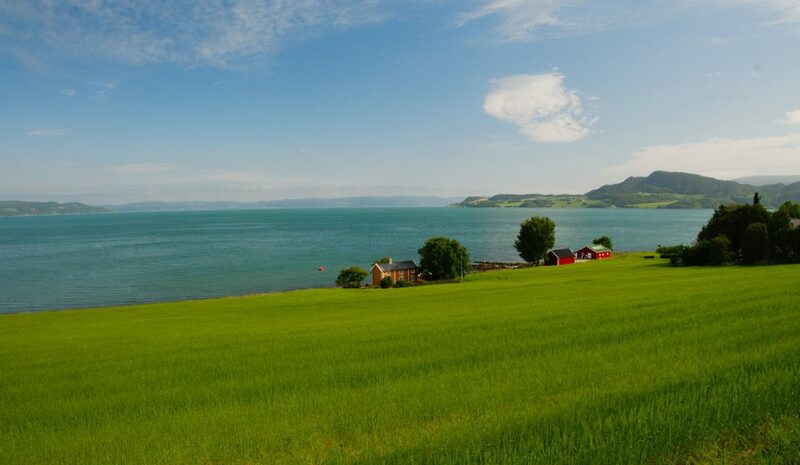 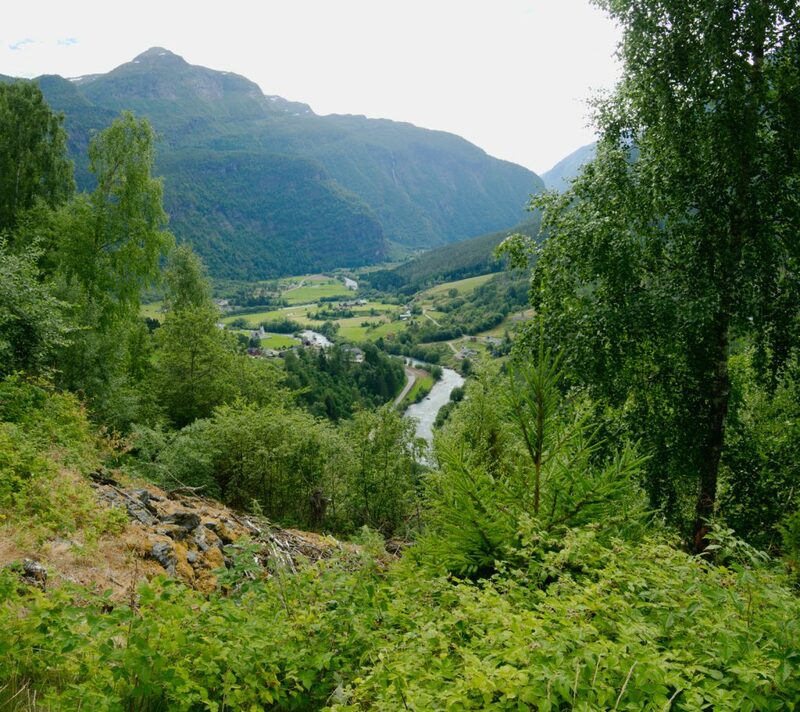 In the vicinity of Trondheim, Norway really turns to a domestic feel: cows accompany sheeps in the pastures, wheat grows on the fields, also nettles started to appear… And also the blueberries, which I’ve been driving around since Finland, finally started to ripe. 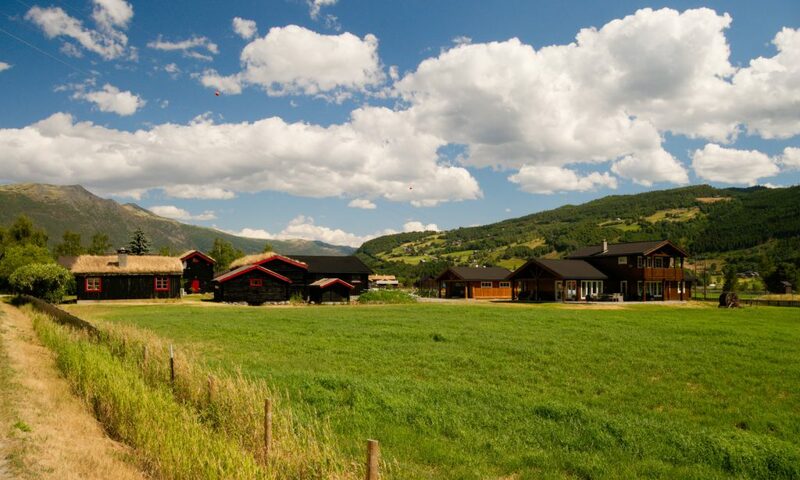 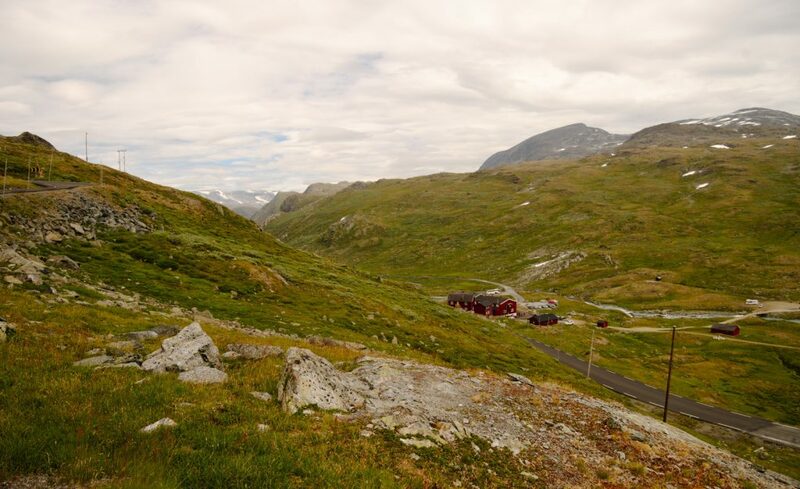 But also the populated areas get denser, so it’s a bit harder again to find a nice place for camping e.g. 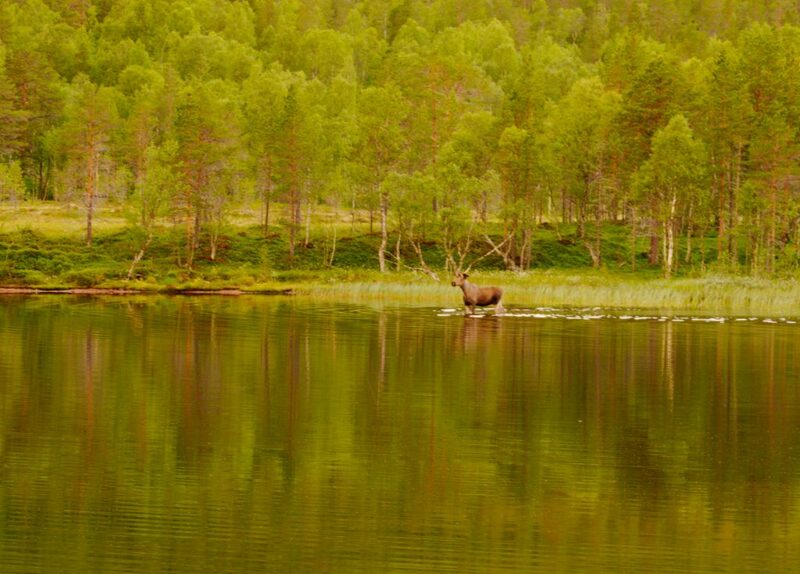 by a lake. 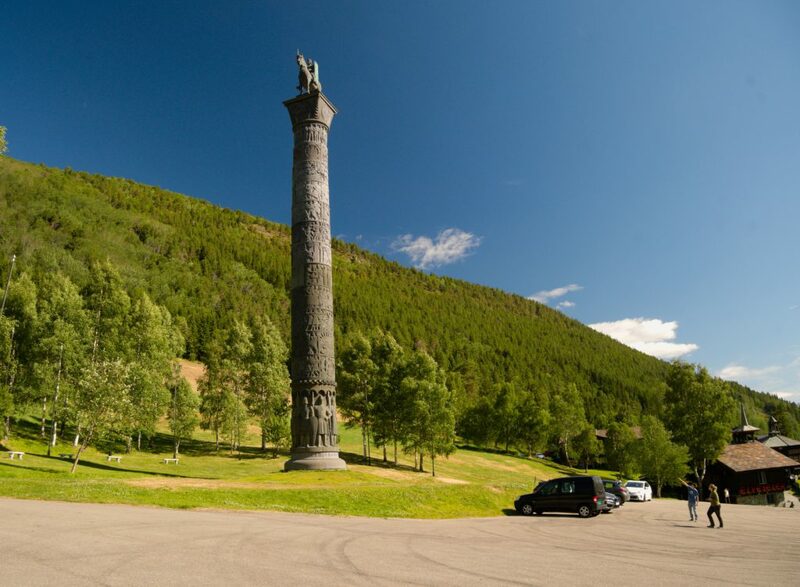 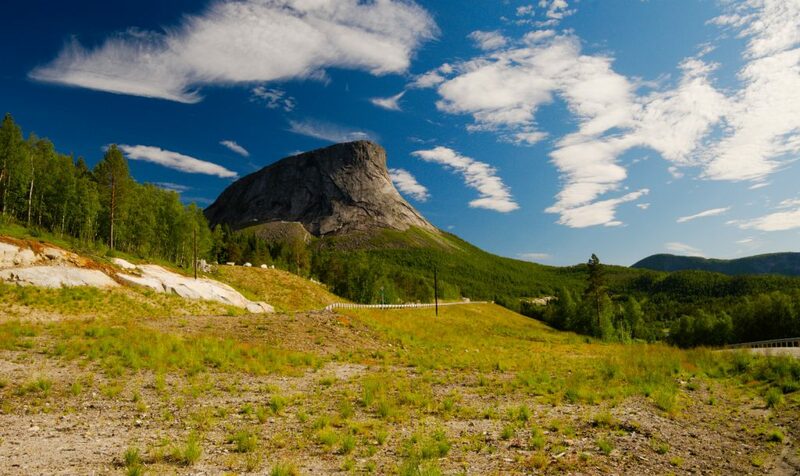 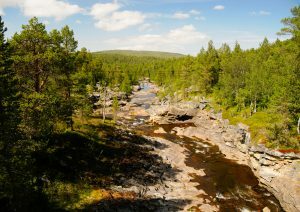 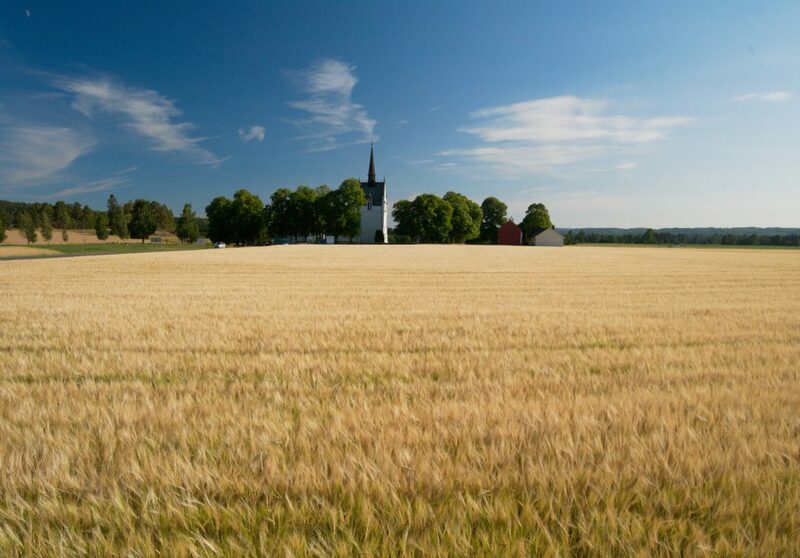 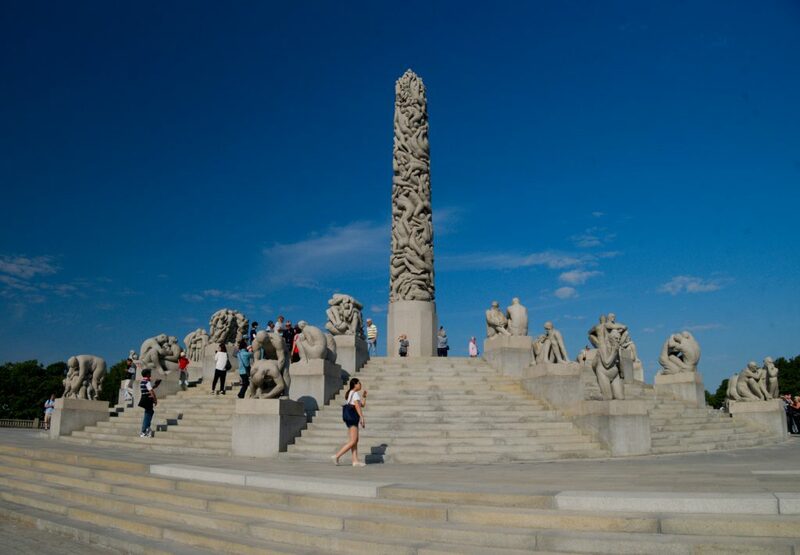 And unfortunately the Norwegians themselves do not actively prepare such places for tourists, as it was in Finland. 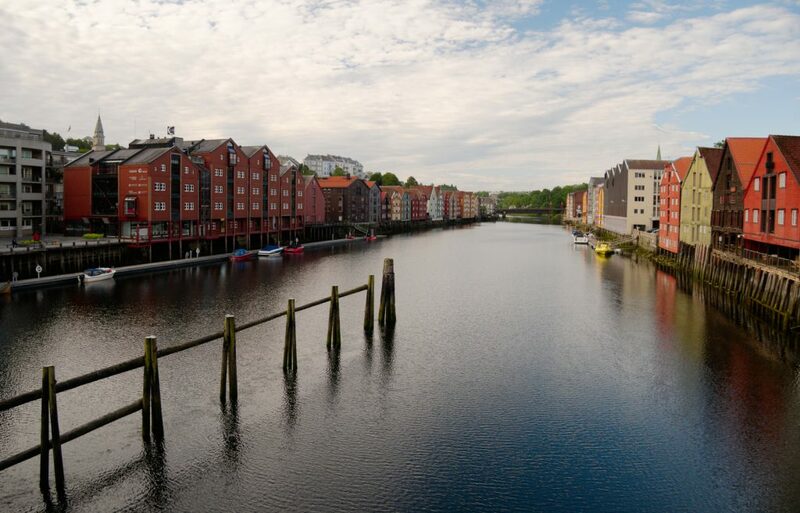 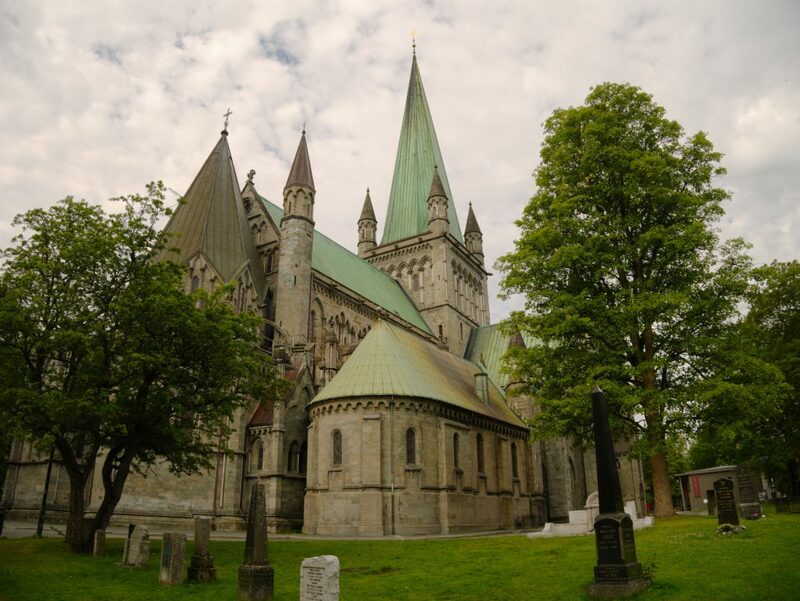 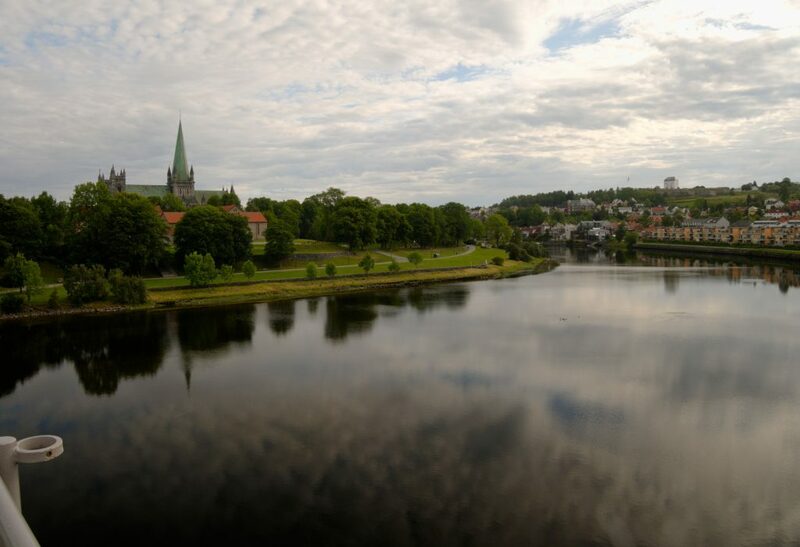 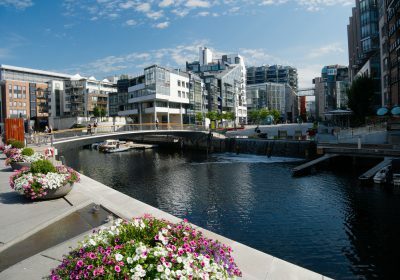 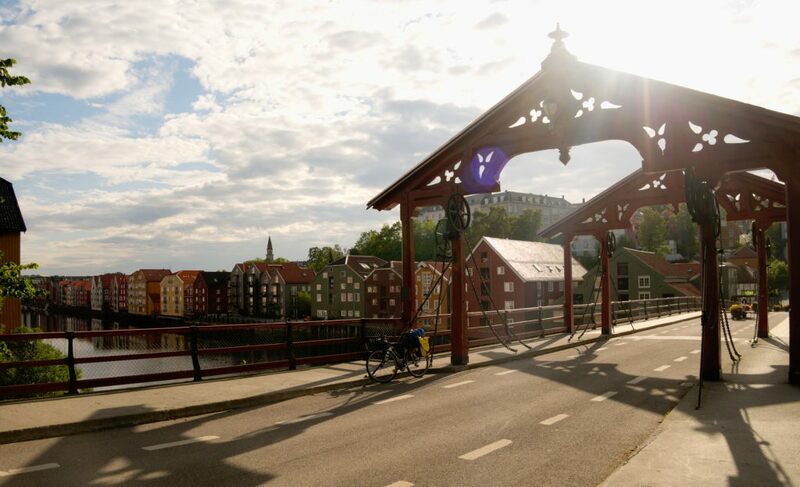 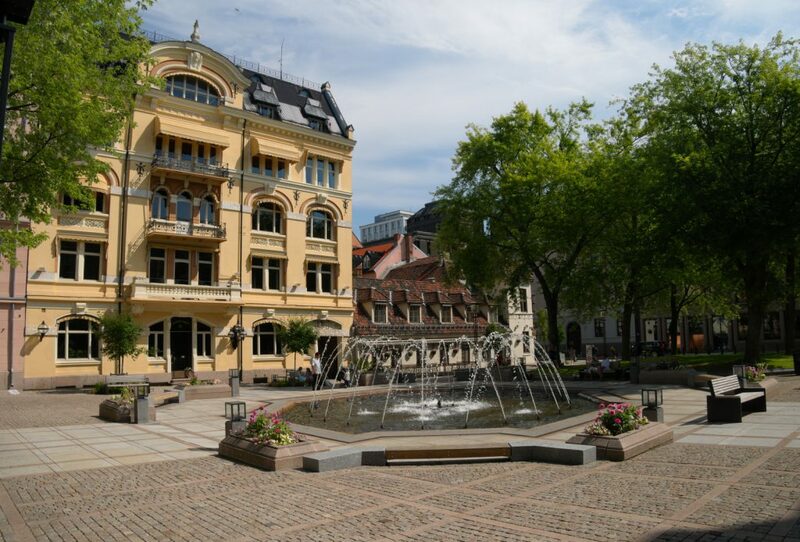 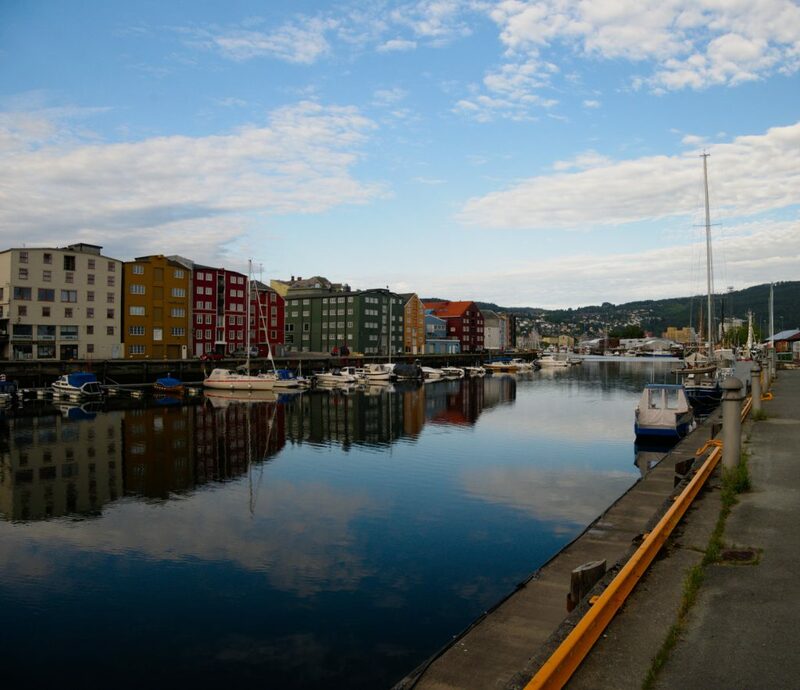 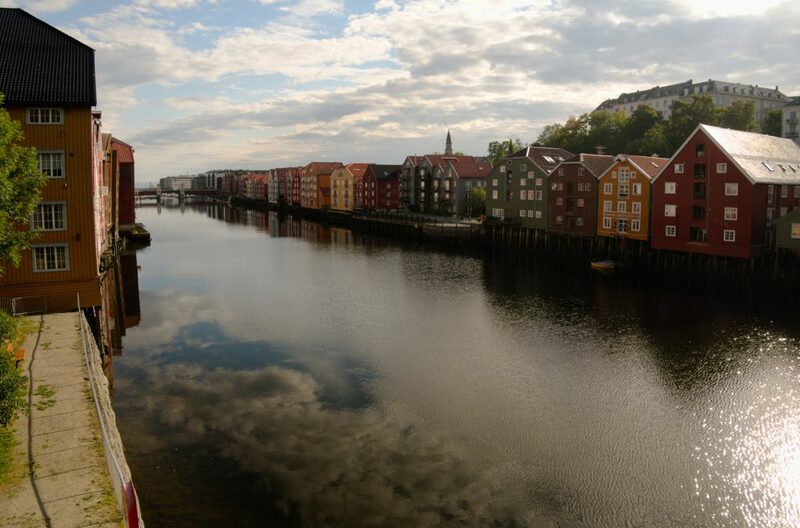 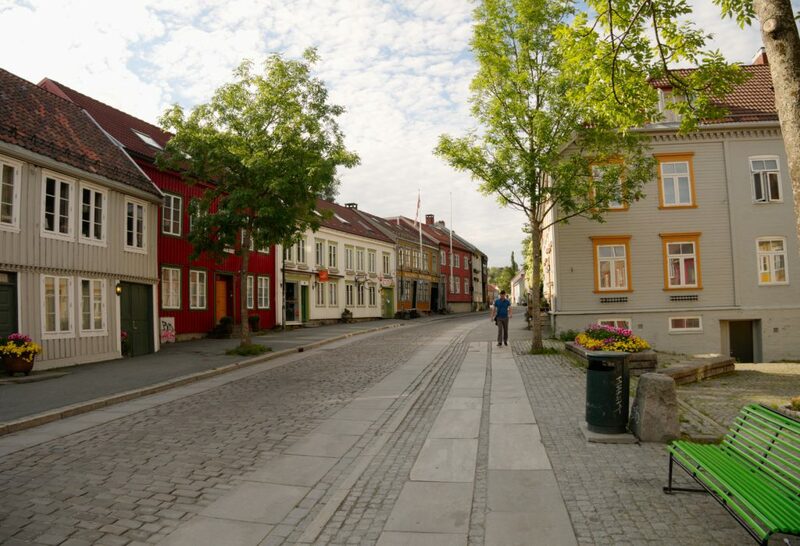 Trondheim itself is the third largest in Norway, but it makes an impression of just a district town. 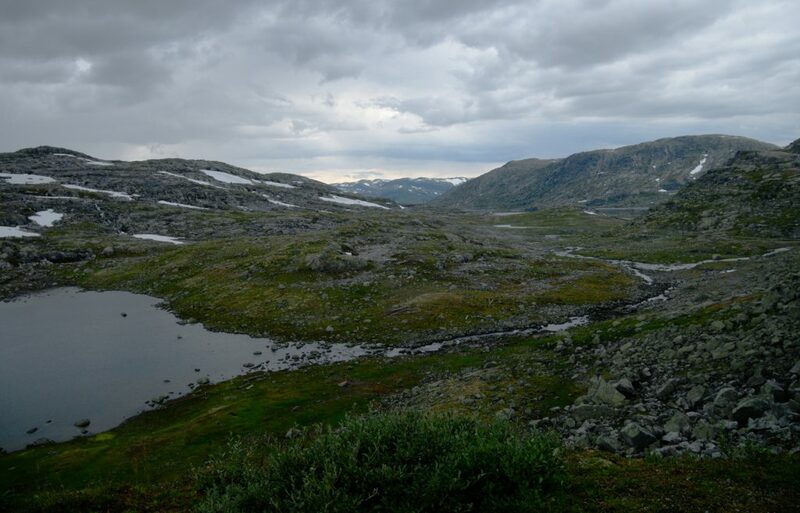 At Trondheim I left the fjords and continued south across the Dovrefjell ridges. 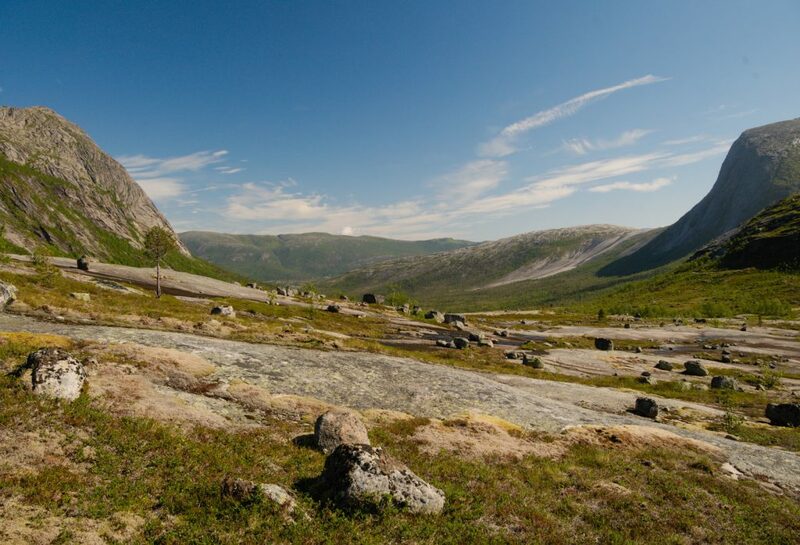 This ridge is reportedly inhabited by (from Greenland imported) muskoxen. But I did not see those. 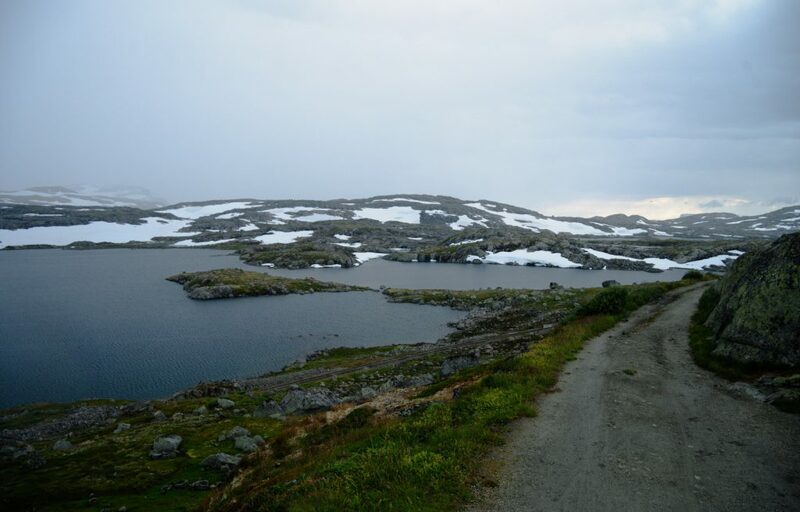 Actually, I did not see even the road in front of me, because a Norwegian cloud completely covered the mountains. 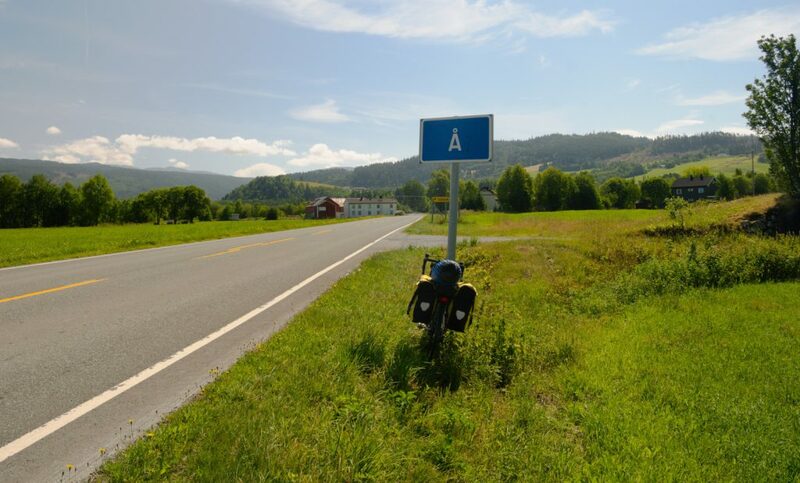 I rode out and above the cloud into a beautiful sunshine only at the very top of the road, on a plateau beyond Hjerkinn, only to dive back into it shortly thereafter. 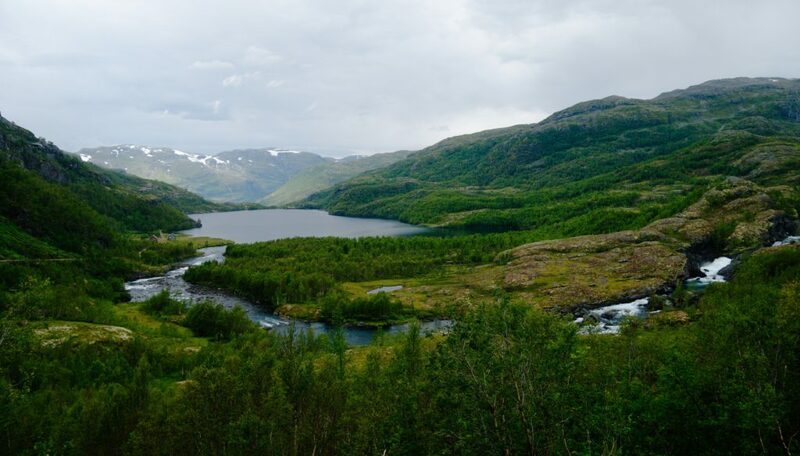 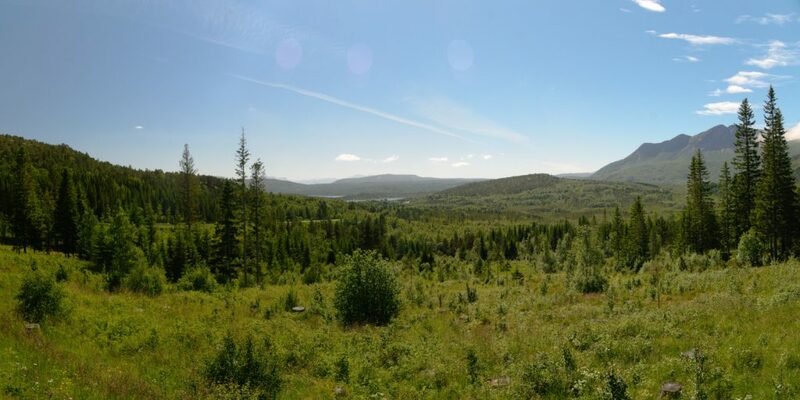 I enjoyed a bit more views later around the valley of Gudbrandsdalslagen and then Otto river, which later spreads across its valley and forms the 40 km long lake of Vågåvatn. 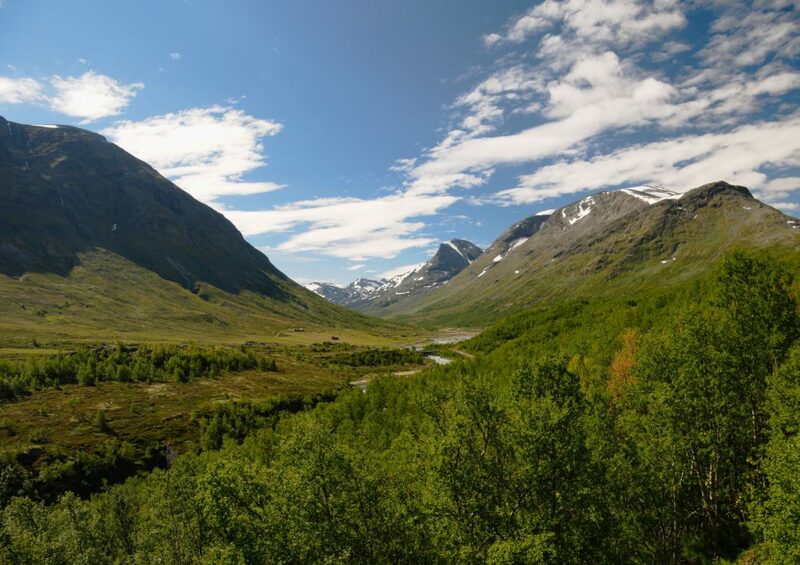 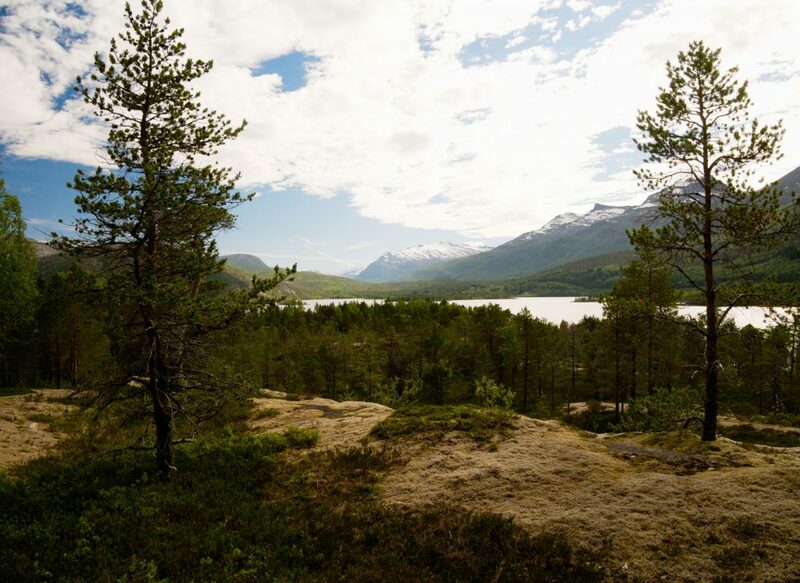 Above the Otto River I had in my way the highest mountain range in Norway, Jotunheimen. 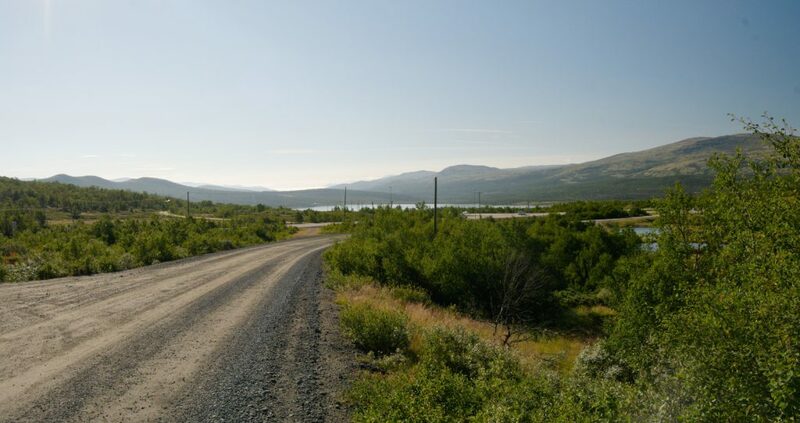 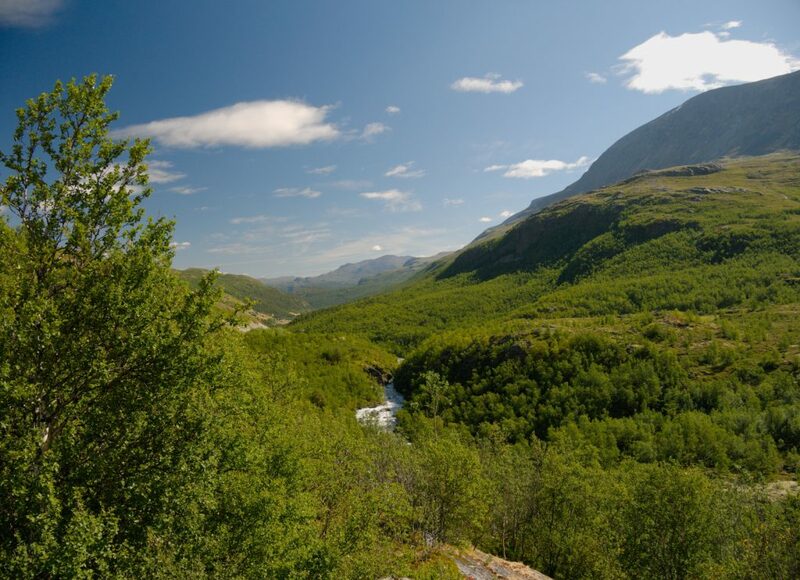 The road up the mountains is first a long, slow and steady rise through a river valley, shaded by the peaks around. 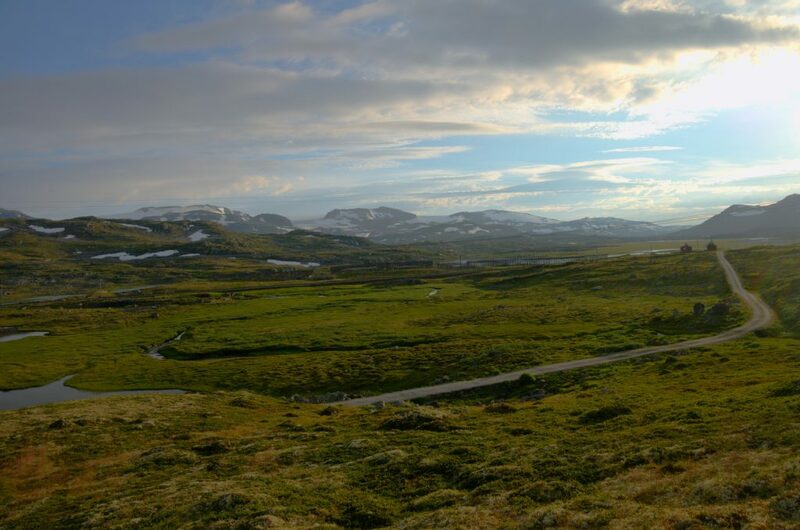 At the top there is no saddle that would provide a view downwards, instead there is again a large, nearly flat plateau. 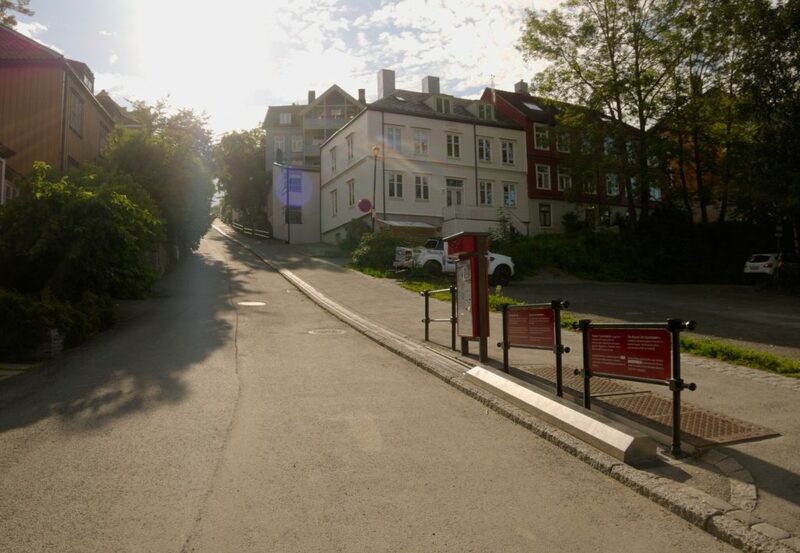 So to take a look around, I had to climb the Prestesteinshogdi hill. 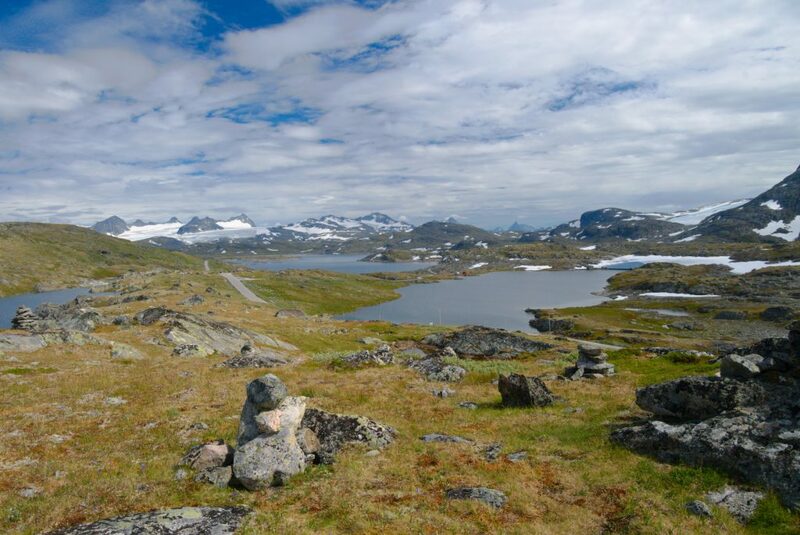 It is one of the lower peaks here, but positioned nicely in the middle to provide a good view on the peaks around. 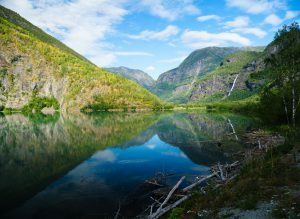 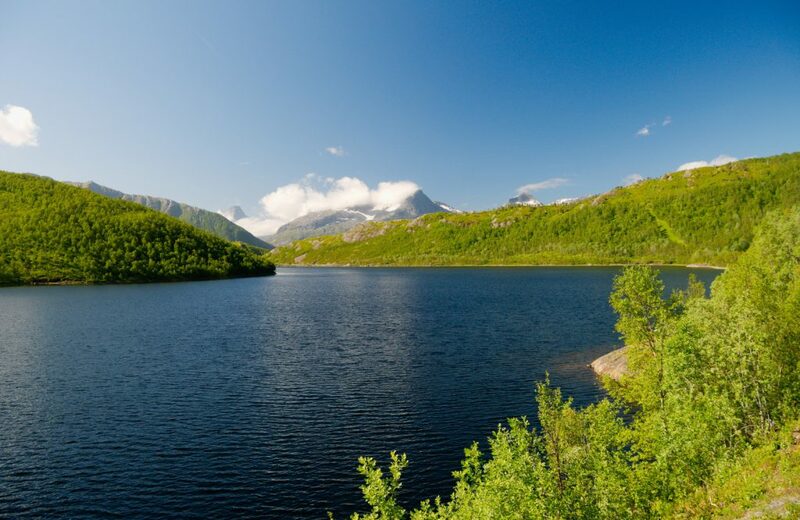 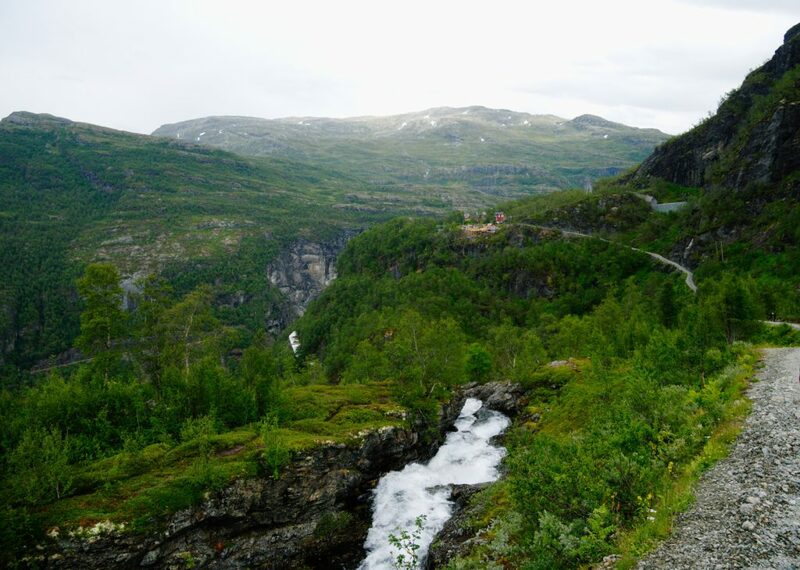 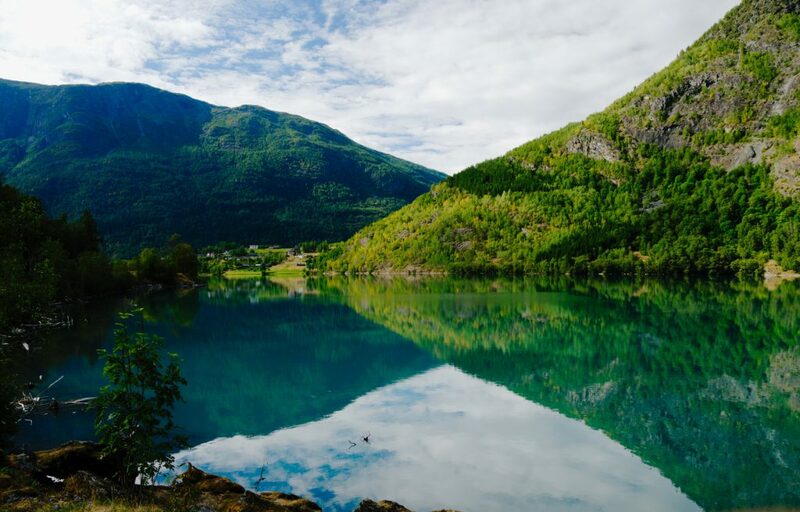 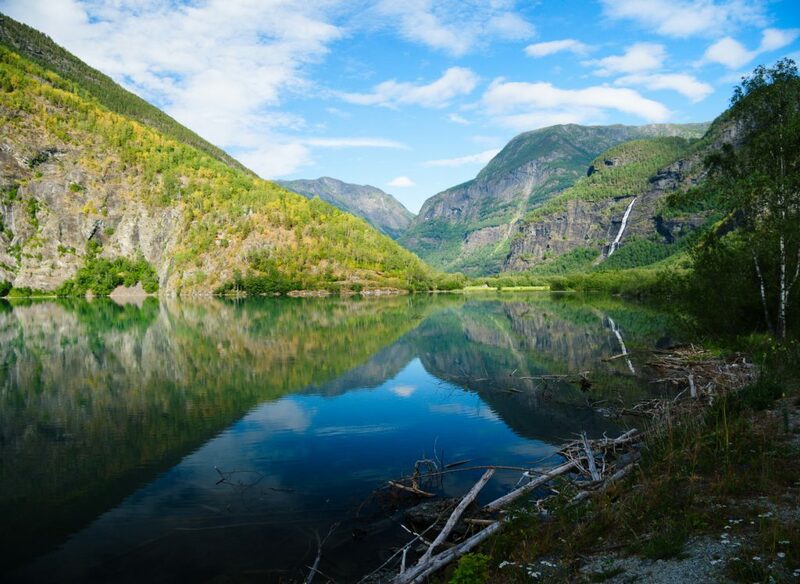 In contrast to the road up, the road down is a steep zigzag descent down to the valley of the Fortundaselva river, which at its end flows into the Eidsvatnet lake, which in turn flows into the tip of the Lustrafjorden fjord. 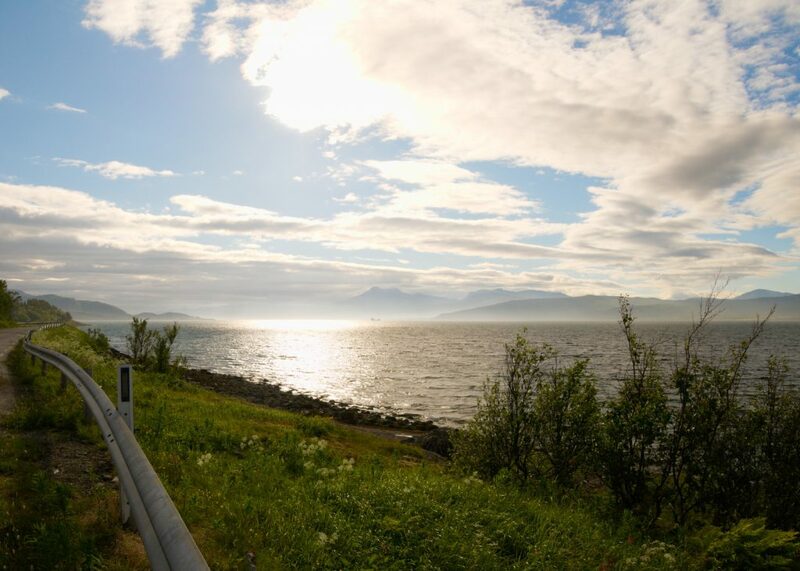 Around the Lustrafjorden fjord I followed a picturesque, pleasantly flat road without traffic while the fjord slopes bathed in the evening sun. 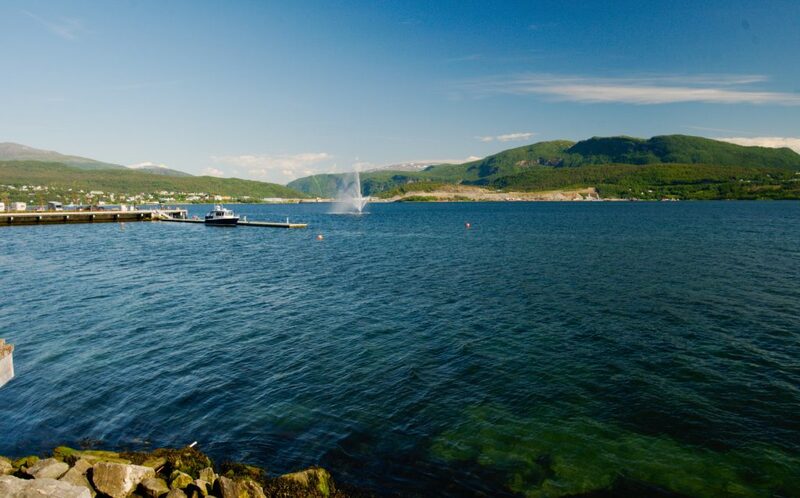 So it happened that I unexpectedly took a swim in the sea here in Norway – a beautiful warm evening, no one around, warm water, and on top of it the water so deep in the fjord contained nearly no salt (it would be possible to drink it), so I had no problem with salt on skin after a swim. 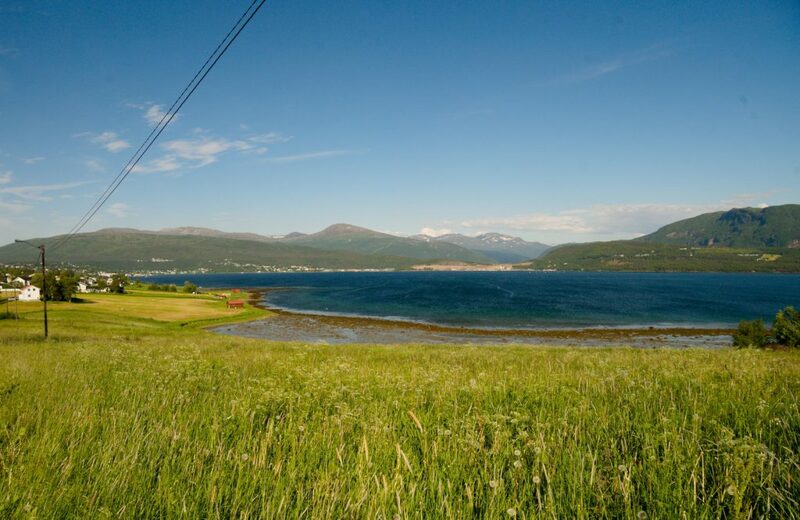 It seems that such sunshine warming up the fjord slopes is no exception here, as all kinds of fruits are grown on the slopes around. 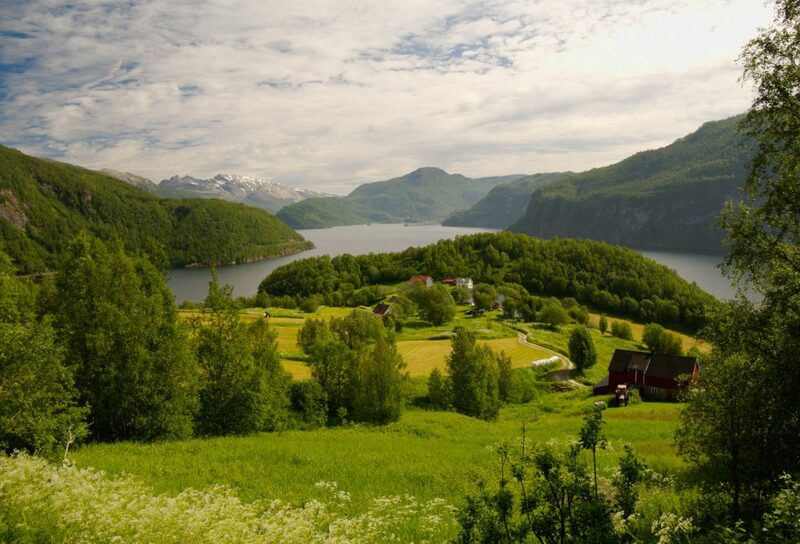 The fjords around here were probably the most pleasant spot of Norway on my way. 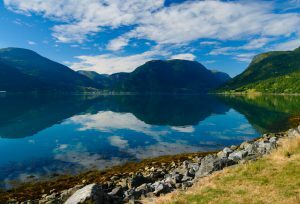 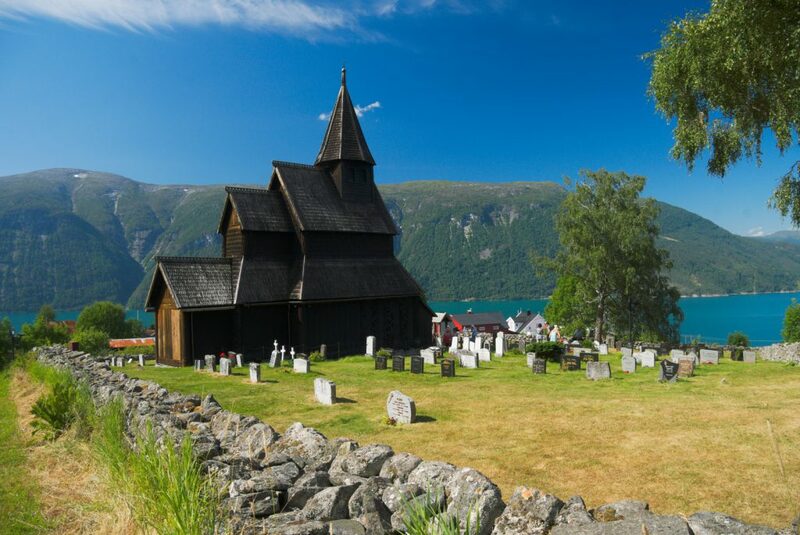 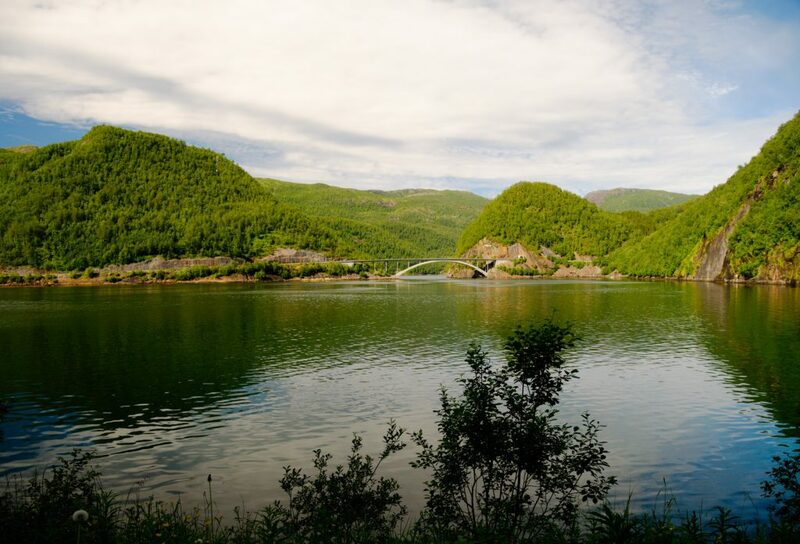 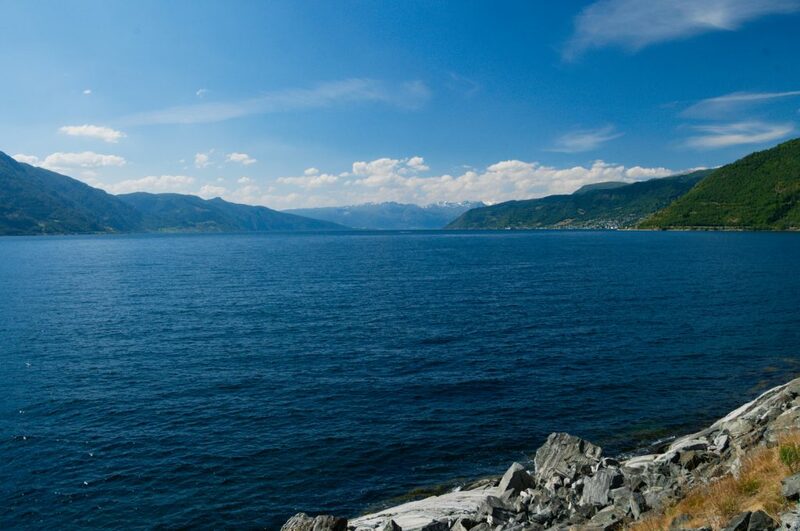 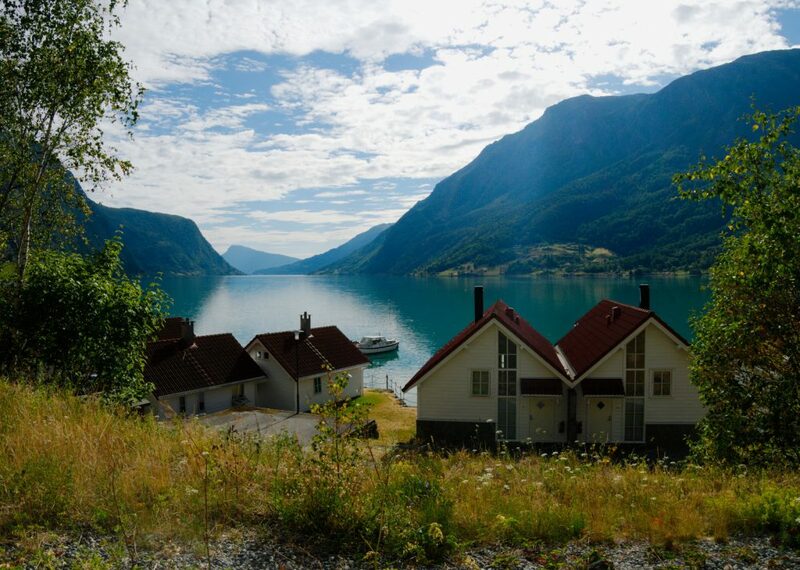 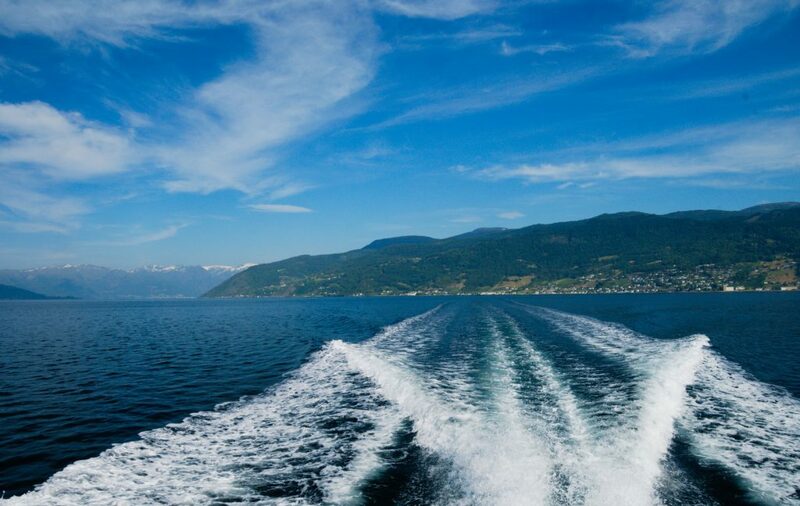 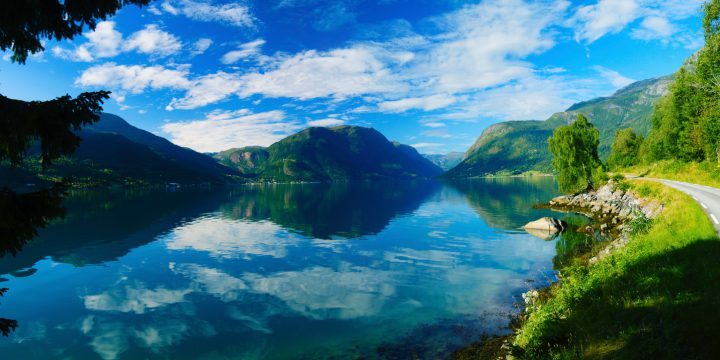 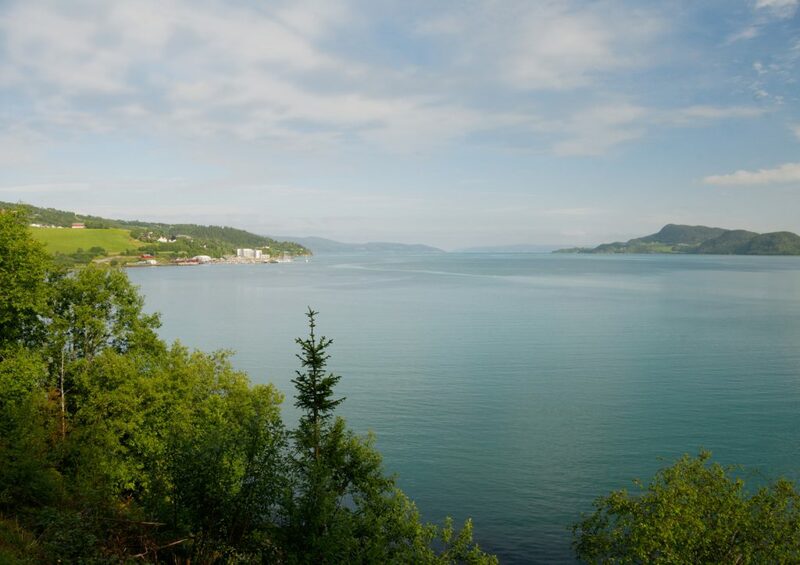 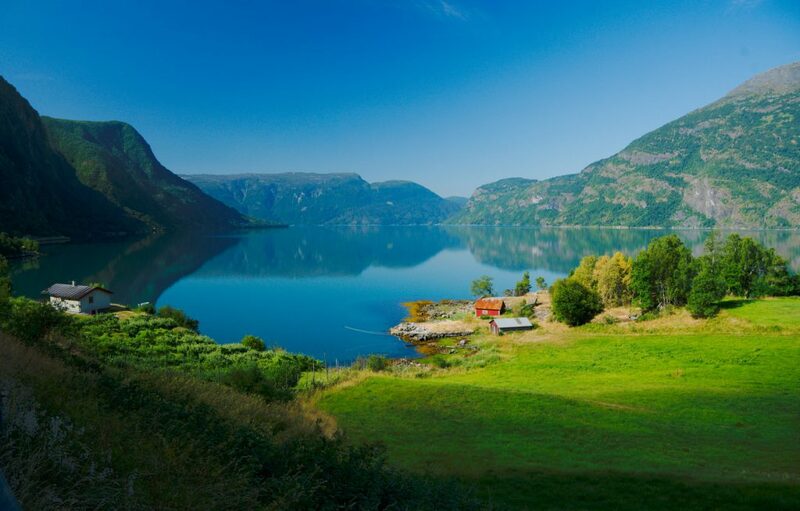 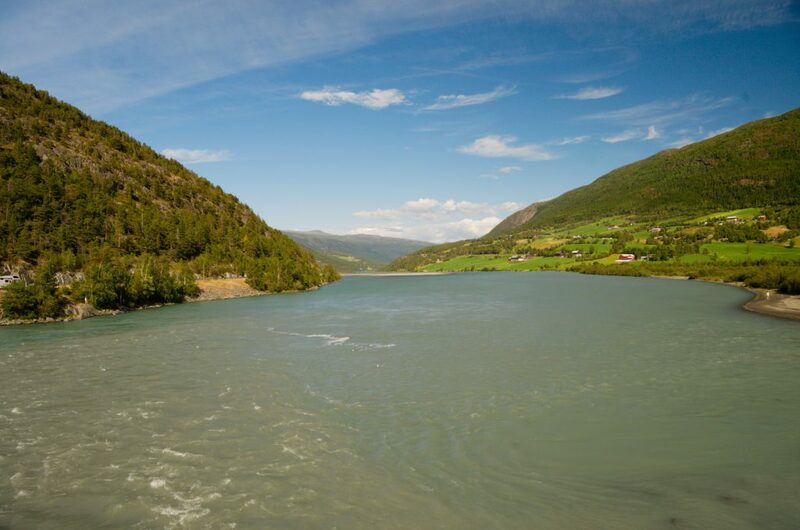 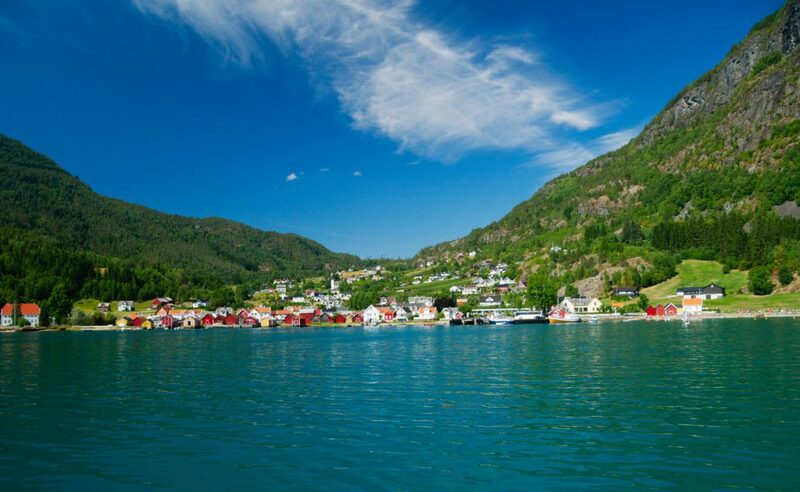 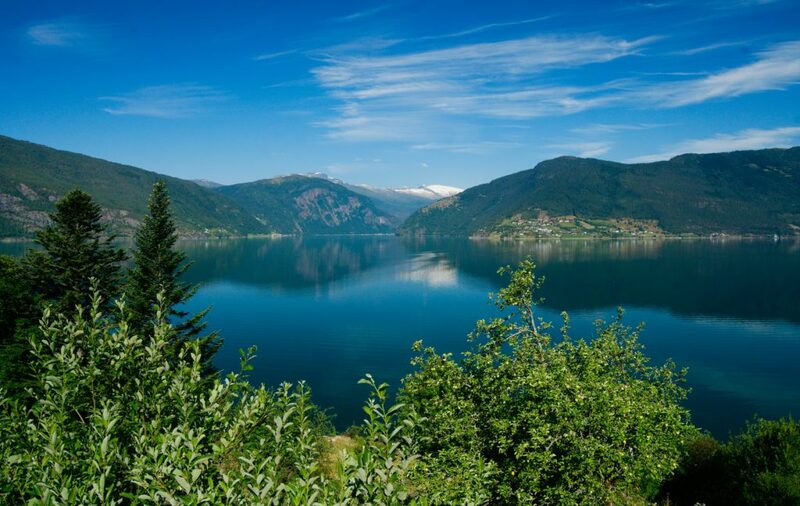 I was slowly proceeding through the labyrinth of the Lustrafjorden, Barsnesfjorden, Sogndalsfjorden, Sognefjorden, and Aurlandsfjorden, always over the hills or via a tunnel to the next fjord and there around the coast to find a ferry in my direction. 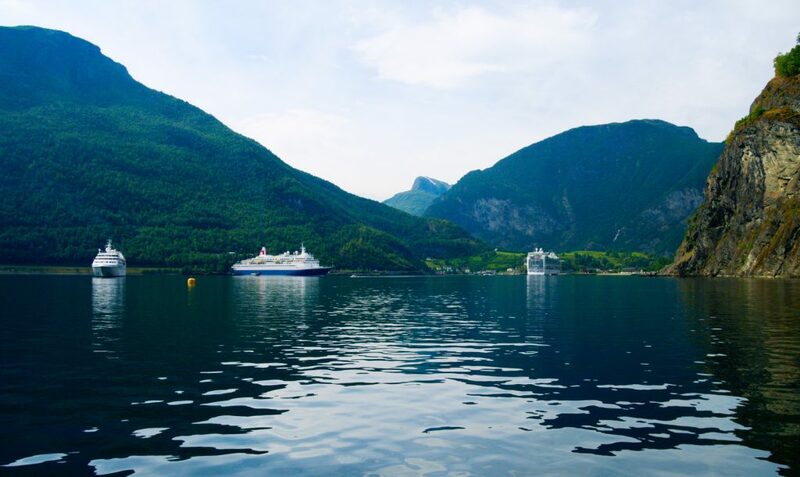 Not as easy as it may sound. 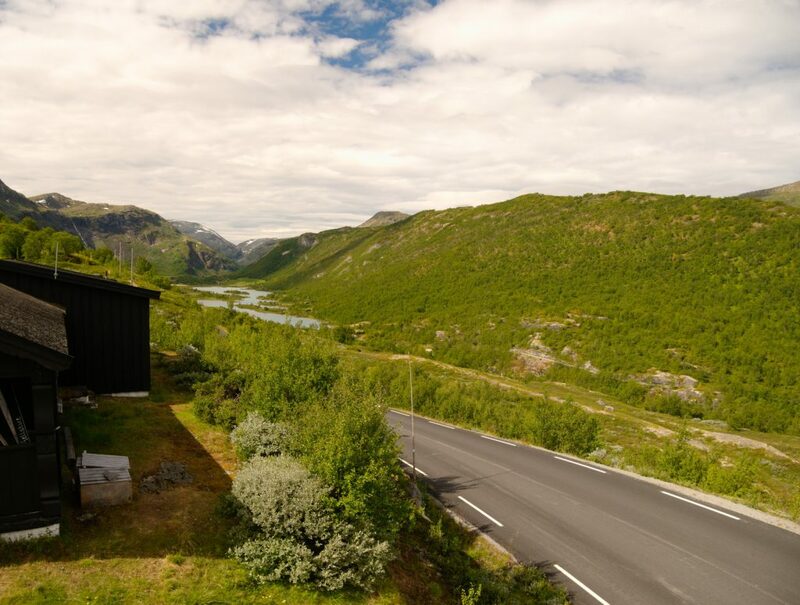 I wanted to get to Flam, but regardless whether I would go west or east, even with a huge detour, I would always end up at a tunnel where cycling is prohibited (for example in one of them because the tunnel is 24 km long). 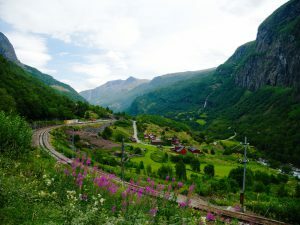 Some of these tunnels can be avoided by a route over the mountains, but that would always only bring me to another prohibited tunnel. 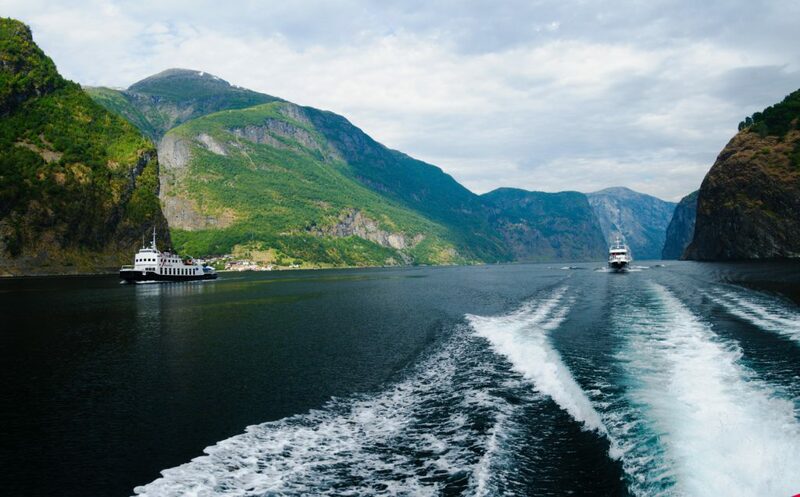 Another option how to get to Flam is a boat, but some boats are tourist expresses that do not take bikes on board, some boats stop by when going from Flam but not when going there, others stop in the port only after a phone order made a day in advance. 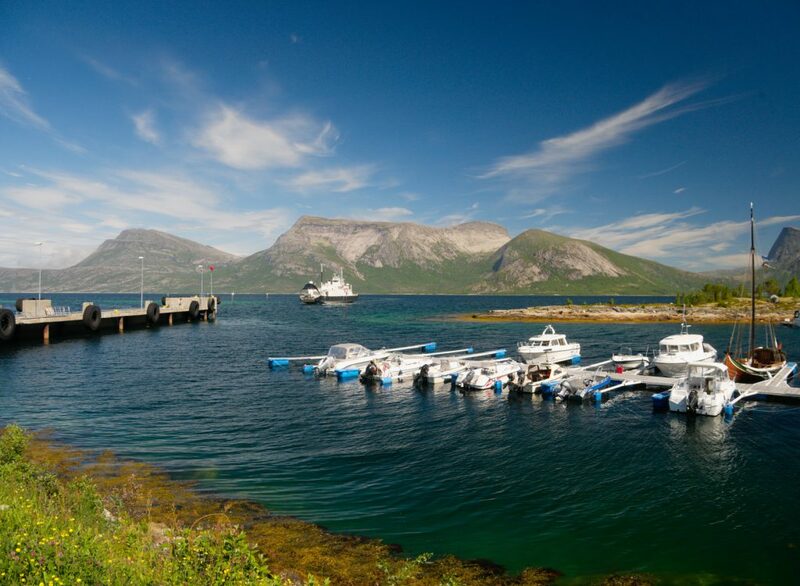 You also need to find out in which town might your desired boat stop – but the timetable is usually missing in the ports. 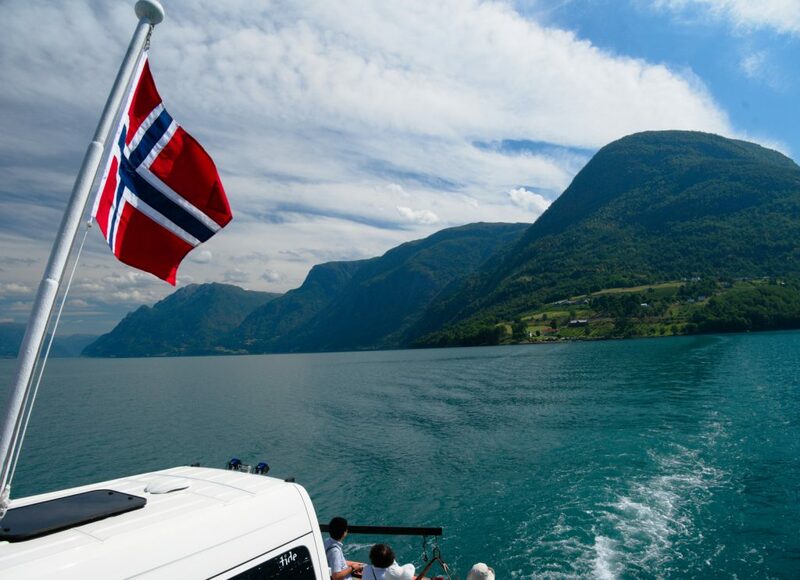 In the end I took a ferry from Ornes and then a boat from Leikanger to Flam. 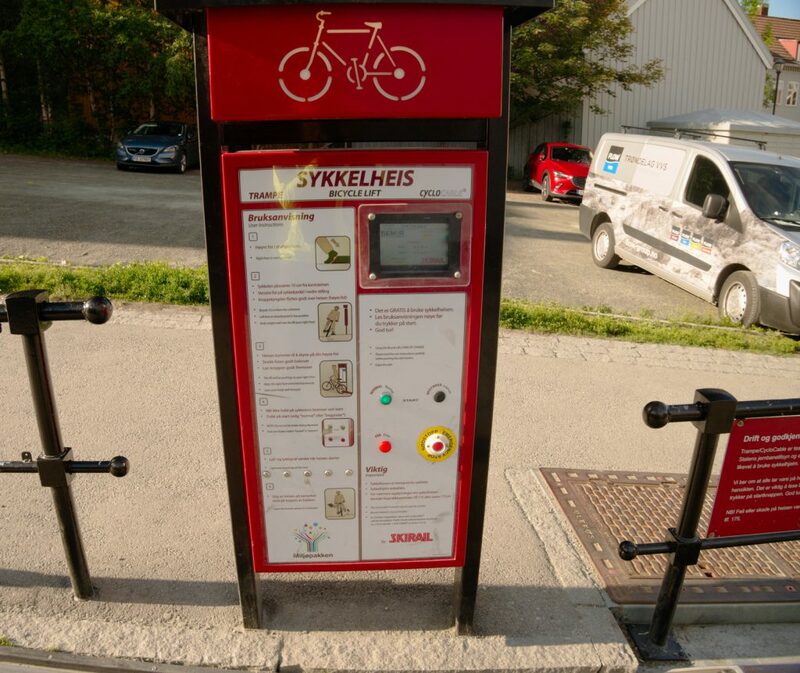 In the latter case their card terminal broke down, so it seemed I will have a free ride again. 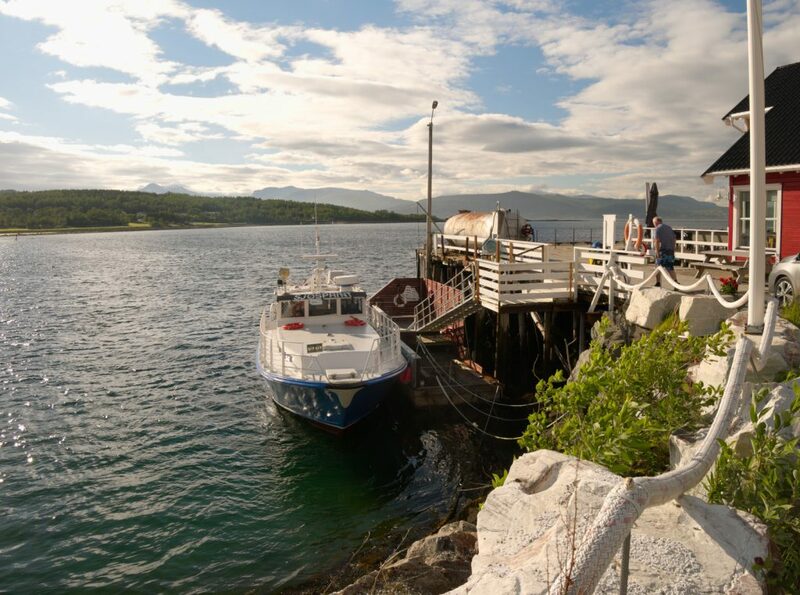 Unfortunately during the ride the steward arrived and joyfully announced me that he managed to fix the terminal for me. 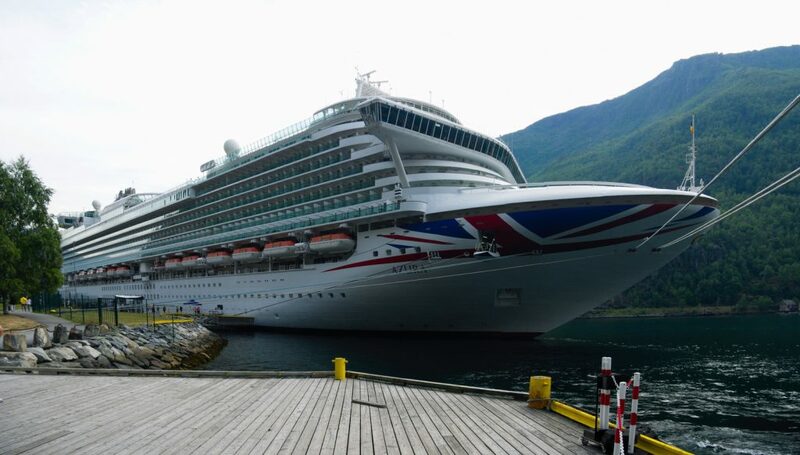 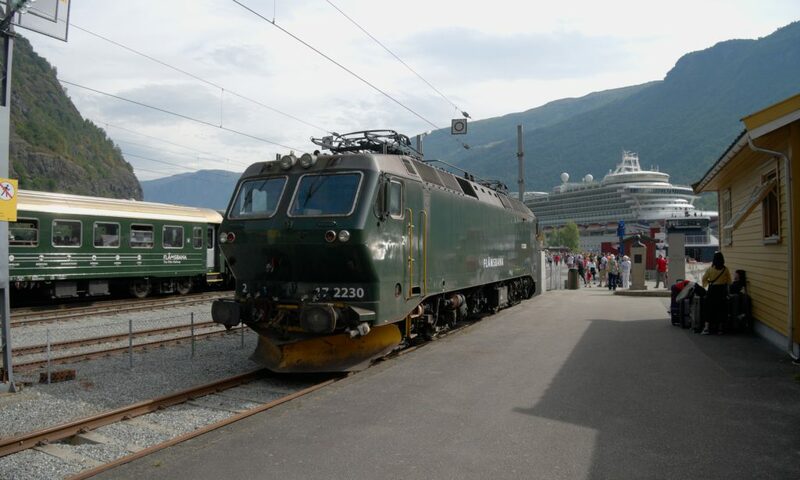 In the small town of Flam rages a touristic hell – tourists flood the small enclosed town coming by huge ships and by train. 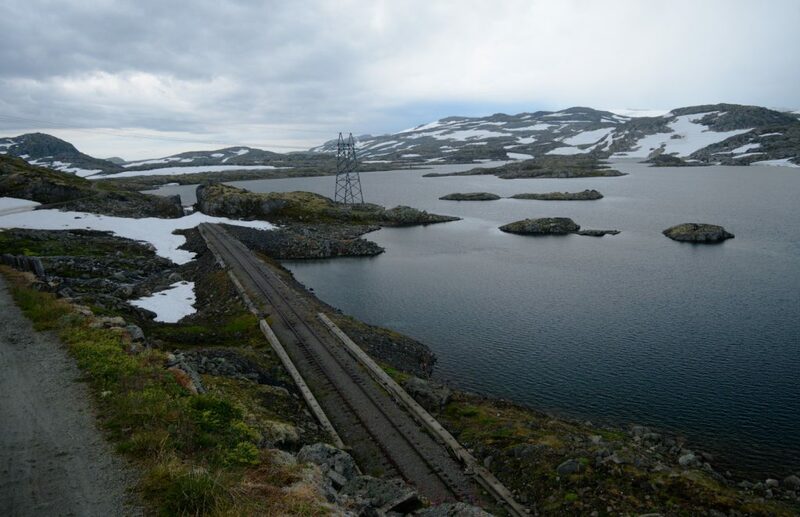 The train itself is a tourist trap – advertised as the track with the most beautiful vistas in Norway, but as I saw later, this most beautiful track today lies dead under the snow, while the new track runs through long tunnels and through metal plated tubes, so tourists probably do not see anything. 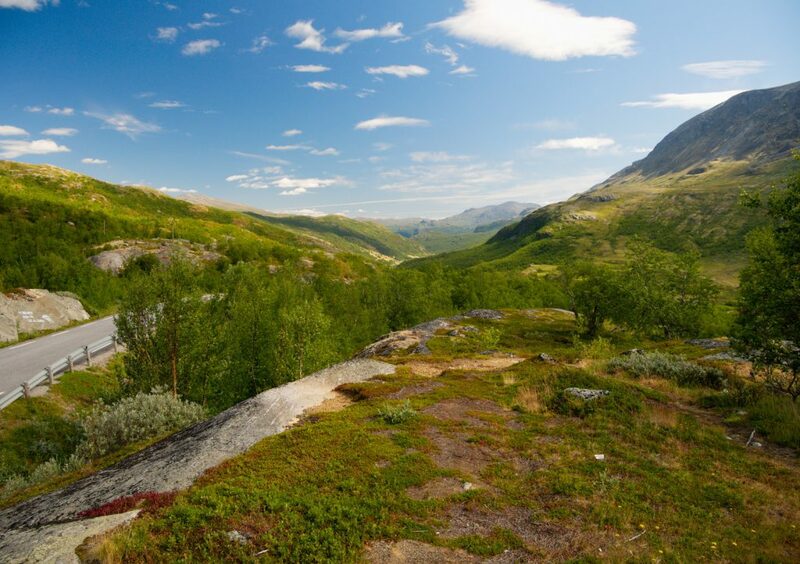 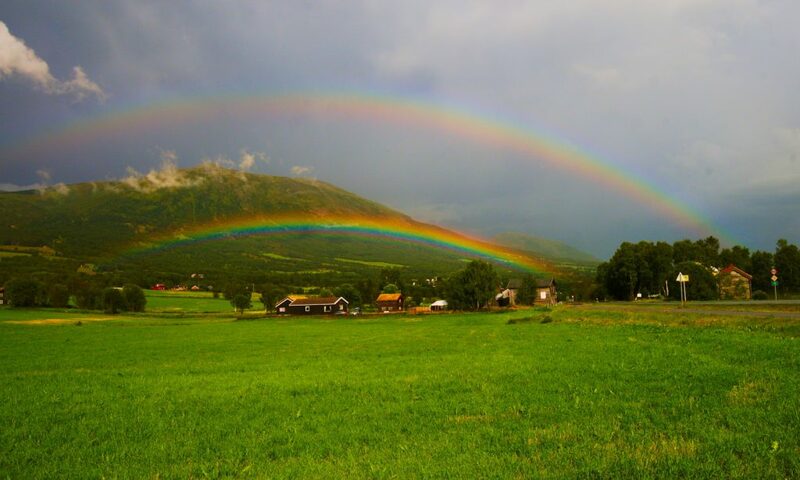 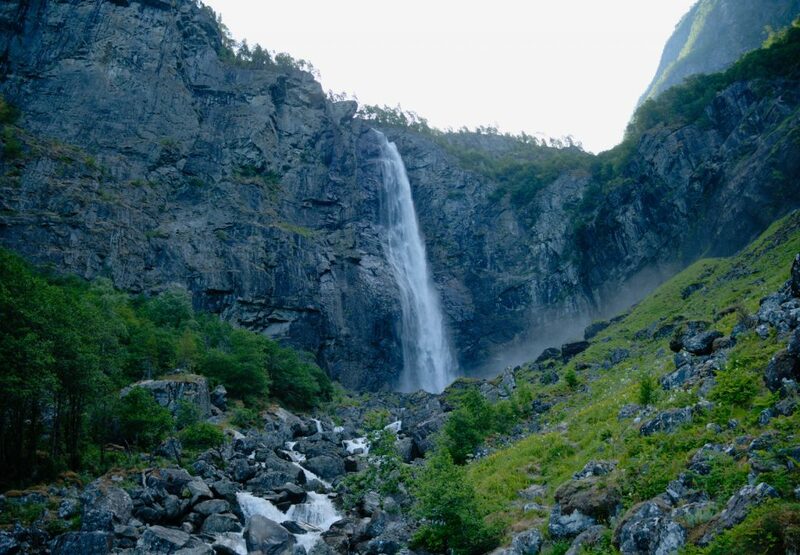 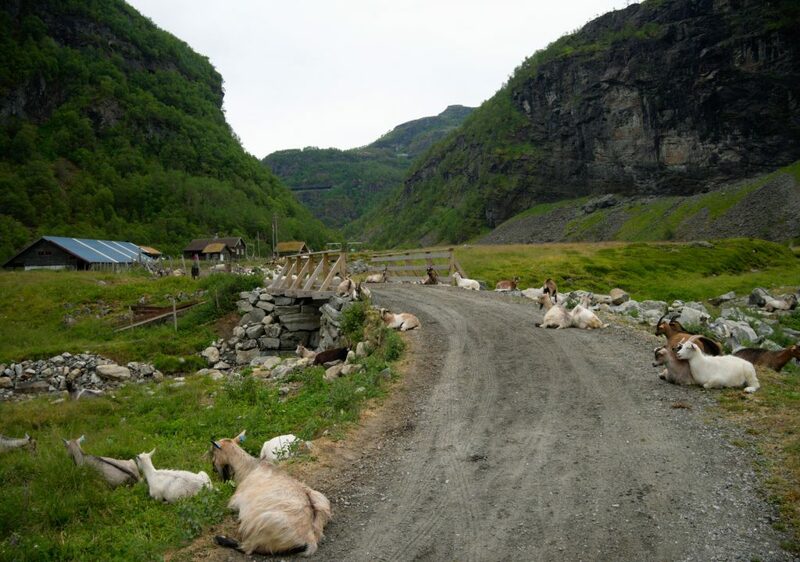 From Flam rises Rallarvegen, a renowned mountain bike trail. 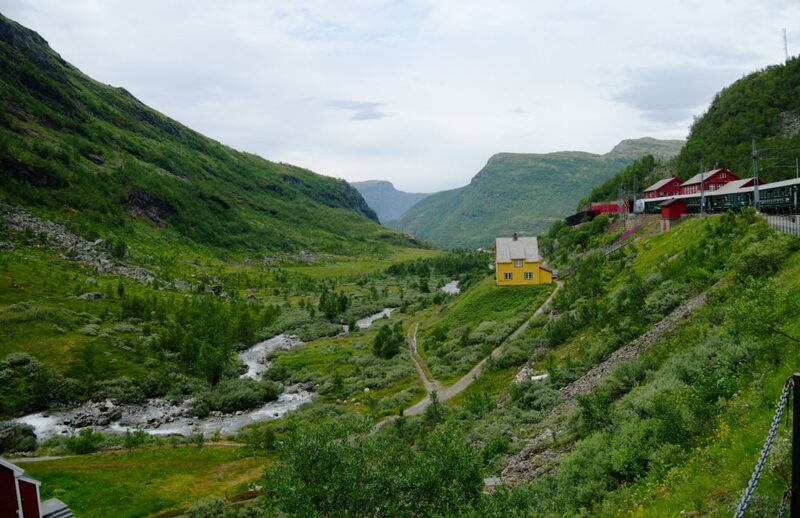 The beginning of the trail is still packed by tourists – they are lifted uphill by the train, there these people many of whom obviously have not ridden a bike in years are seated on a rental bike and they are sent in a crowd 900 m downhill through scary zigzag poor gravel road. 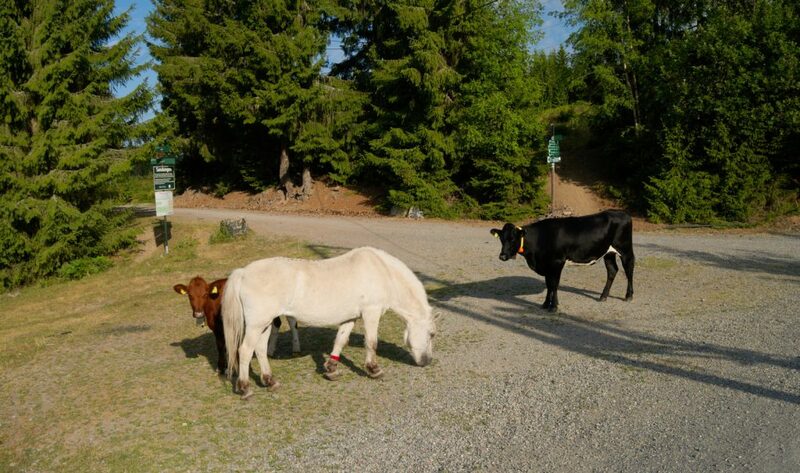 When I saw them, I wondered about the mortality here. 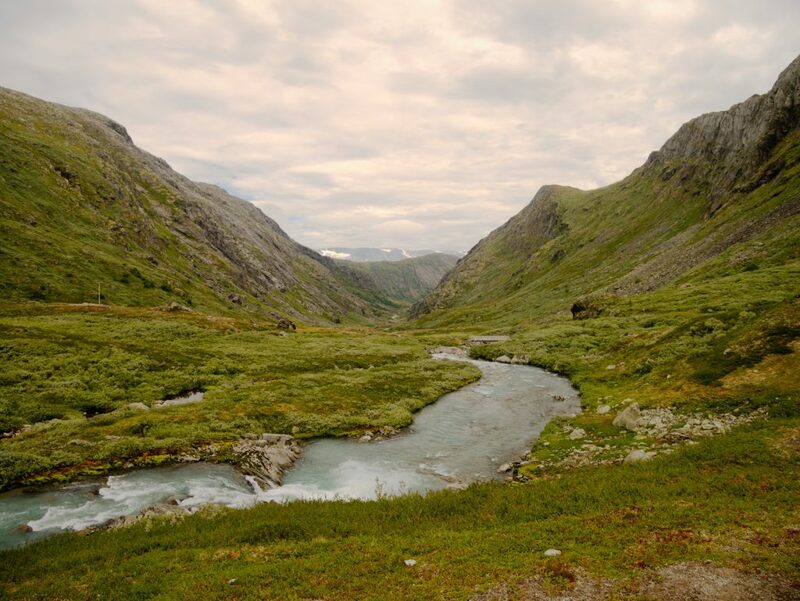 But beyond this point the trail calms down and one starts to understand why is it actually renowned, even when I no longer enjoyed the beautiful weather of the previous days. 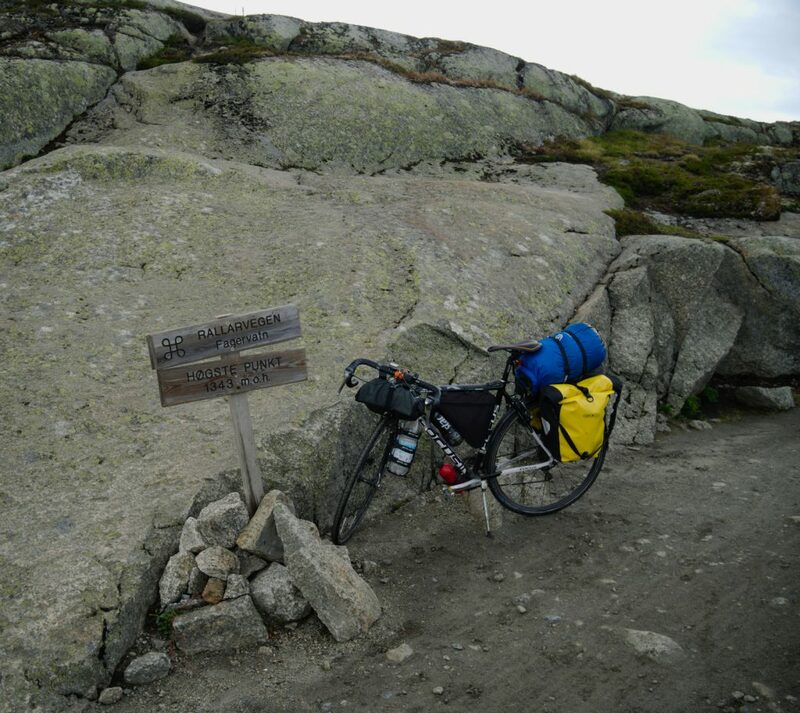 But the trail is also challenging – I and my rack reminded ourselves the Carpathian roads. 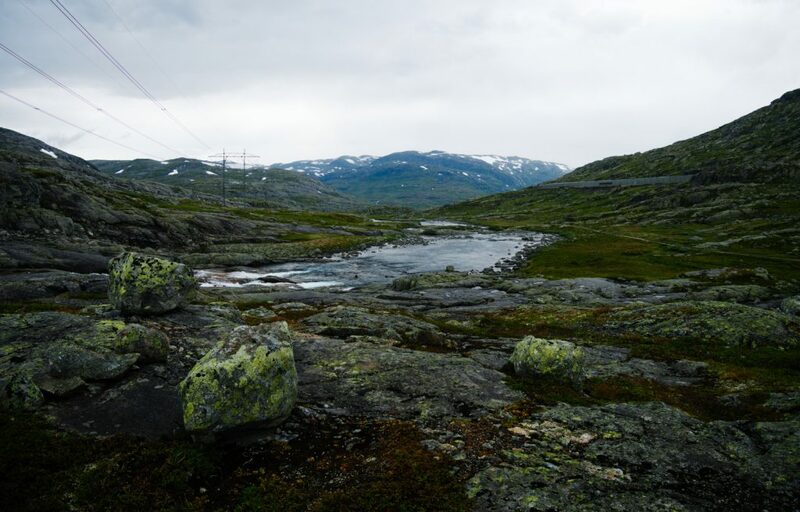 And compared to Carpathians, here I had to immerse not just the shoes but also the wheels into the snow. 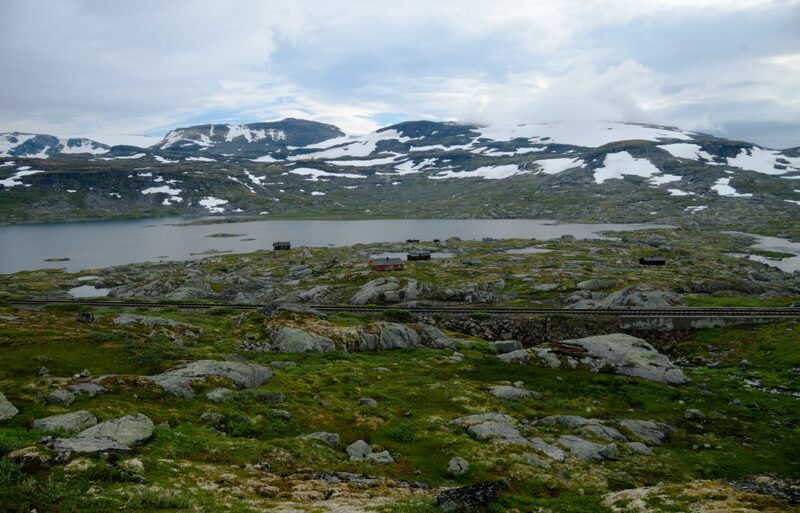 From the end of the trail I enjoyed a slow descent practically all the way to Oslo. 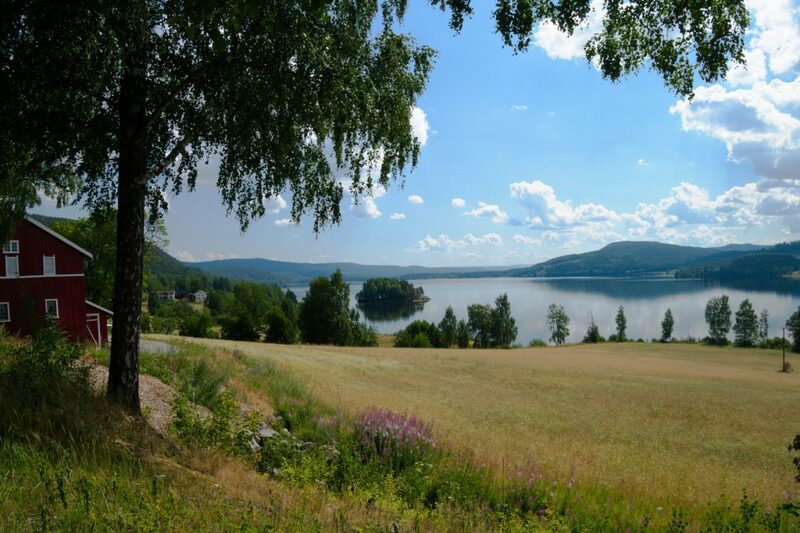 Towards Oslo the hills disappear, but in the hot weather that awaited me it was pleasant that the lakes remained. 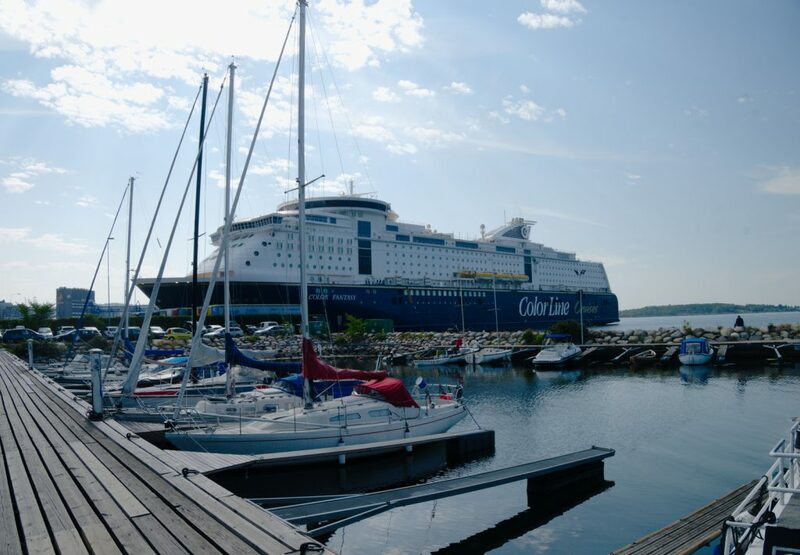 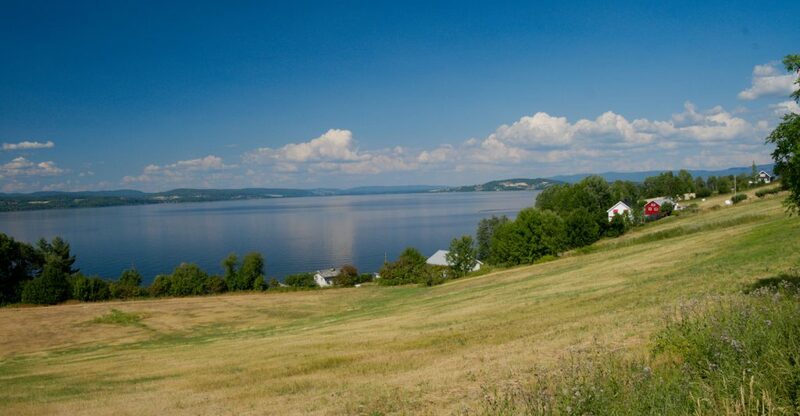 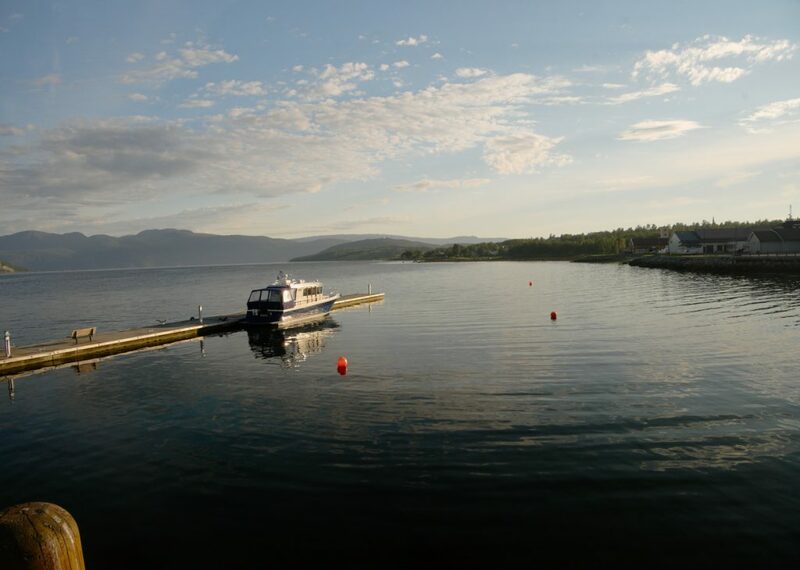 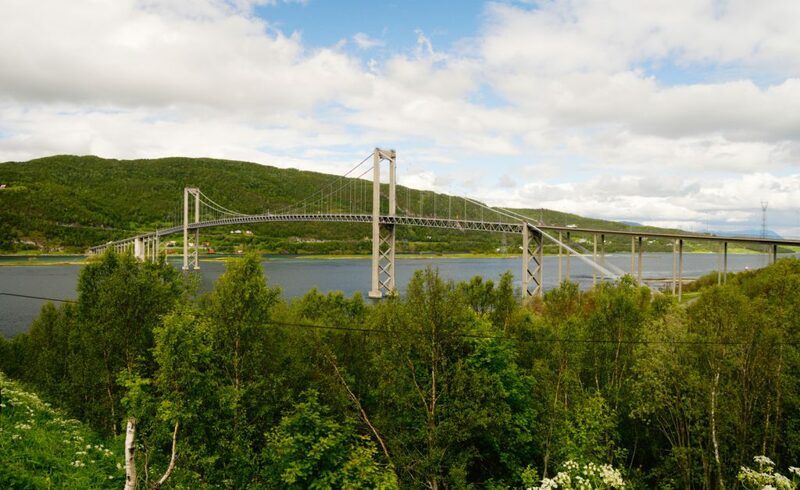 The nearest one to Oslo is Tyrifjorden, which is in this summer weather one big recreational base for Oslo – and it was here where the murderer shot kids in 2011. 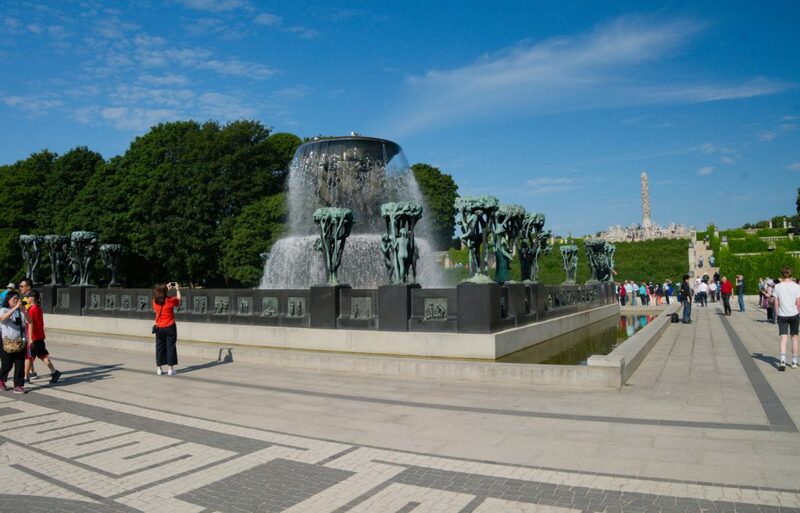 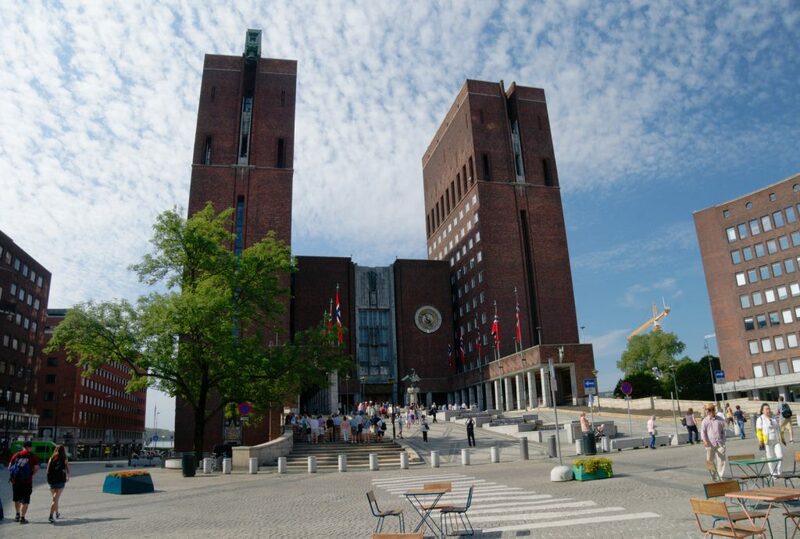 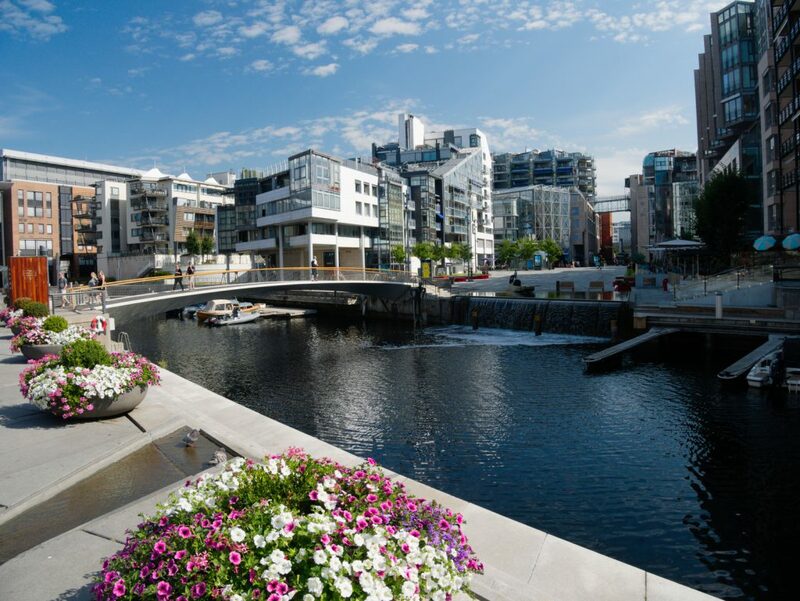 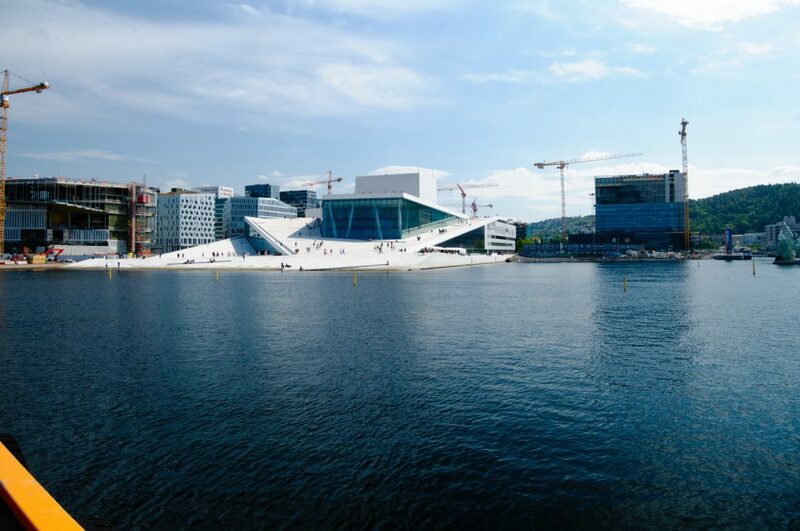 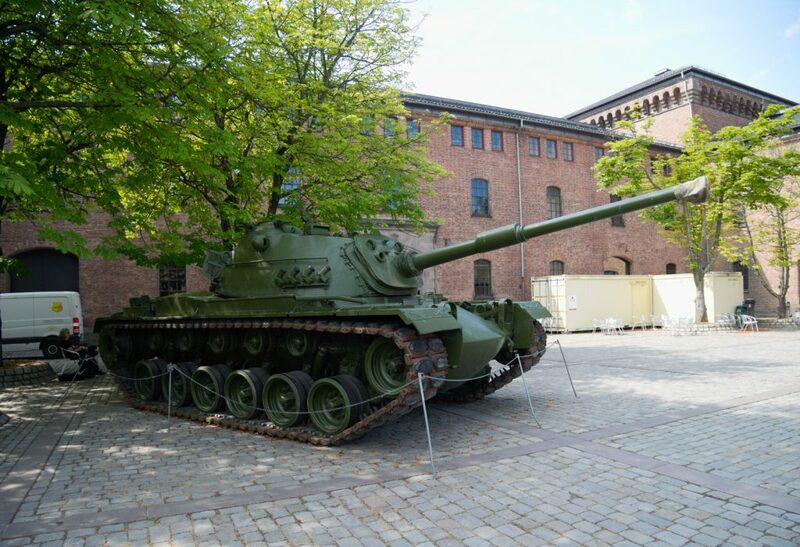 While Oslo may not be a big capital, it is definitely an expensive one. 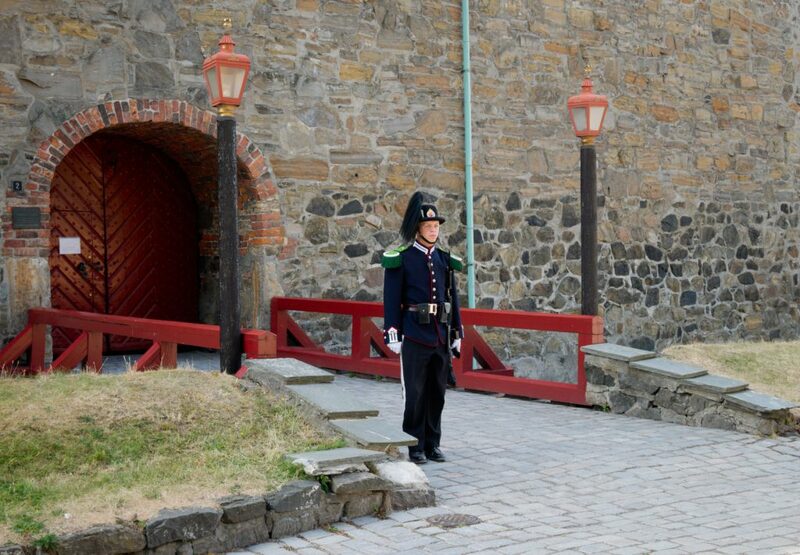 It has relatively few historic buildings, perhaps because of fires, perhaps because it has not been always capital. 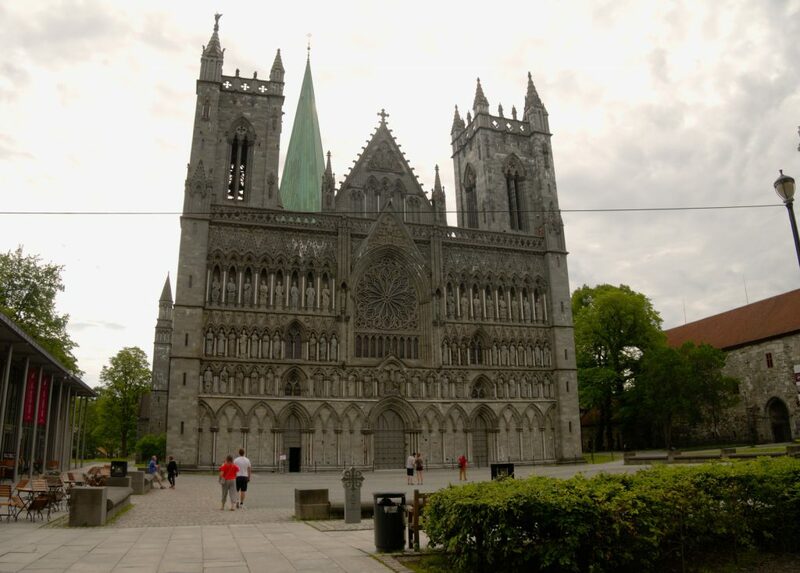 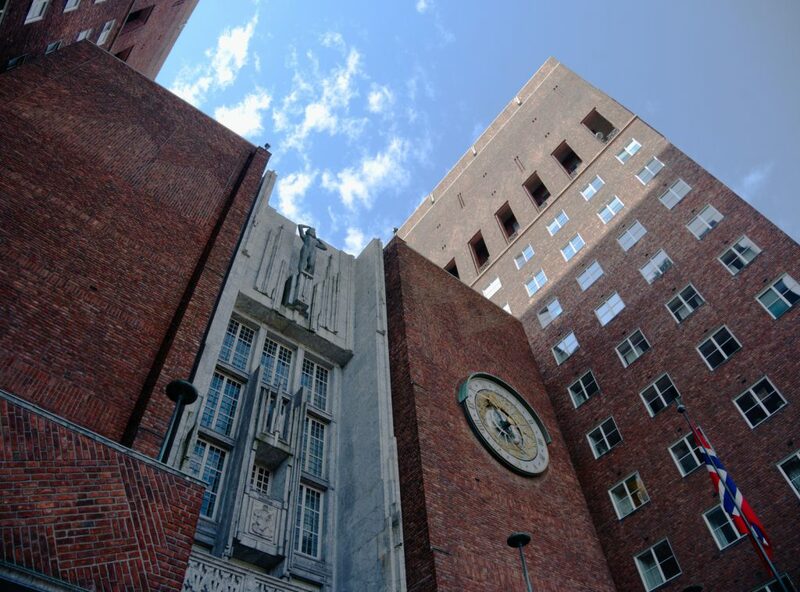 However, it compensates this by modern architecture. 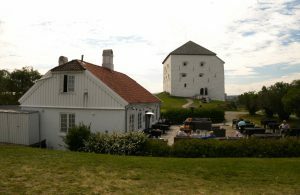 The centre is guarded by a castle, still used by the army to this day. 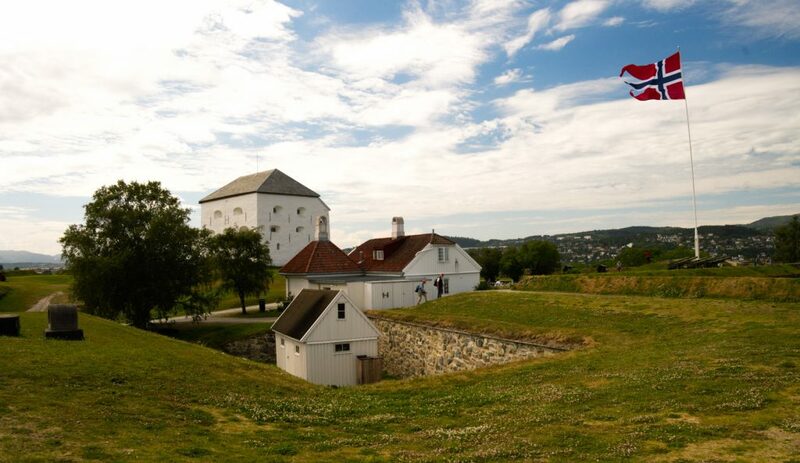 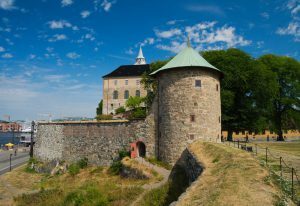 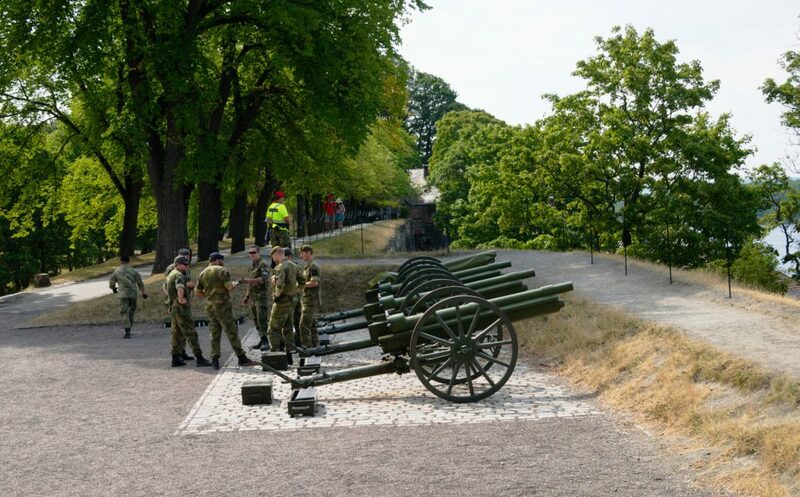 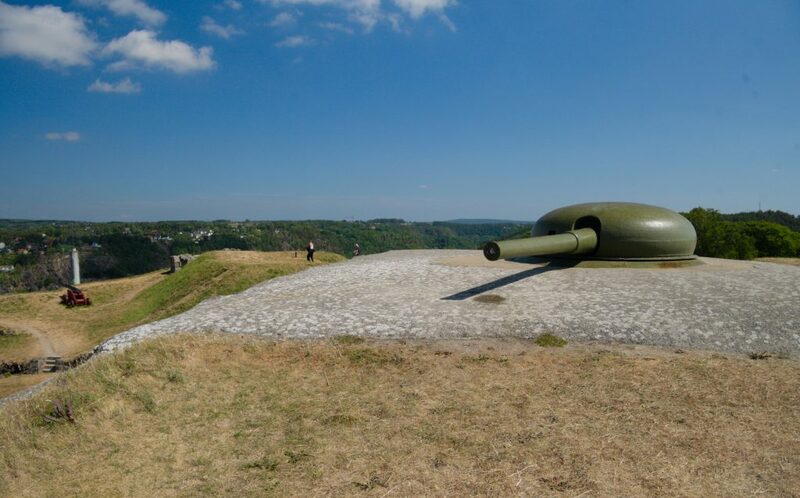 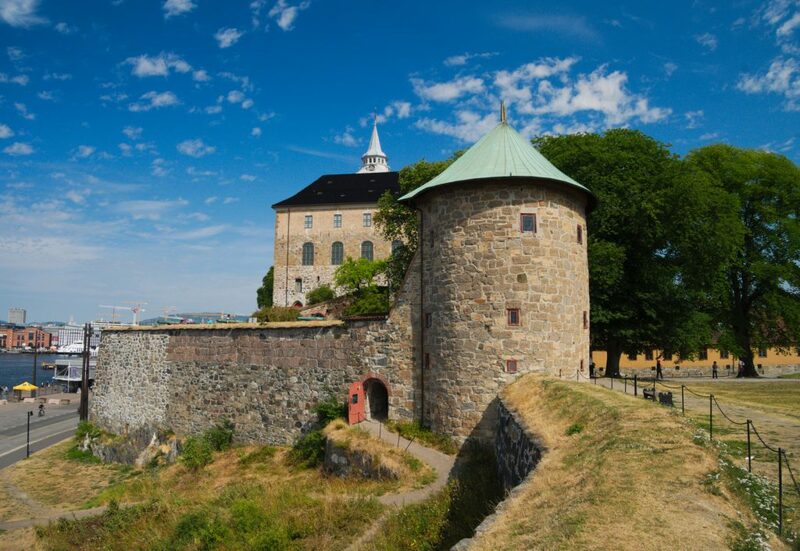 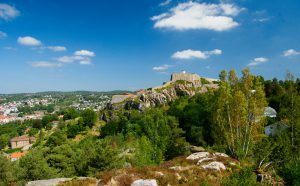 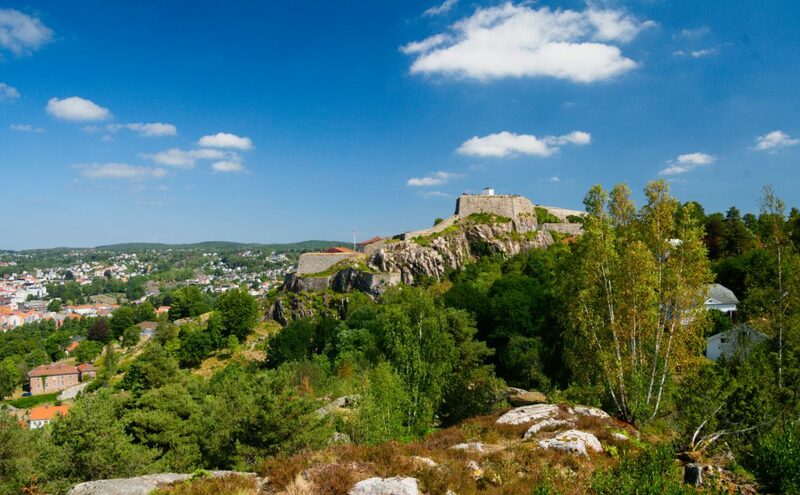 From Oslo I went south via the the Glomma river valley, stopping at the Fredriksten Fortress in Halden, which guarded the border with Sweden up until the first world war times.